The middle school girls who are uncomfortable in Science are being given extra lessons after school hours by Fr. Viven. These enrichment classes are a way devised by our ever giving Principal, Sr. Marilla to help bring these children to the level of the class. This approach is nit only dynamic but without a spoken word, it teaches the children and teachers to go beyond their comfort zone and reach out to places where the need is greatest. Our very sporting and enthusiastic teachers did us proud at ‘Jaco Gurukul’ – an event organized by the Interact Club of St.James School, A.J.C Bose Road. On 24 th July, by winning the 2 nd Place in the singing and Dance Competition. The teachers were judged overall on their performance in singing and dance. Our teachers hard work paid off and they were judged the first runner up in the competition. Our heartfelt gratitude to our Principal Sr.Marilla D’Souza for her support and encouragement. Jawaharlal Nehru once said children are like buds in a garden and should be carefully and lovingly nurtured as they are the future of the nation and citizens of tomorrow. 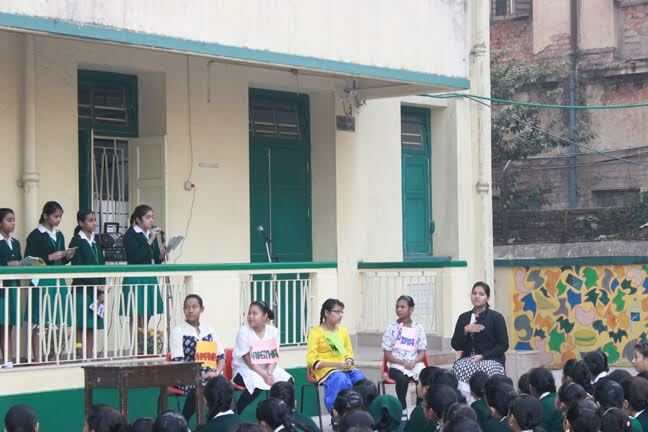 On the 15th November Loreto Day School, Elliot Road witnessed the celebration of Children’s Day. The school looked like a hub of gorgeous young girls with colourful clothes. The programme started with a prayer service. It was followed by powerpoint presentation on Jawaharlal Nehru. It was then followed by a silent comedy and a number of dances. It was a wonderful day for both teachers and students. The programme ended with an encouraging speech by our Principal Mrs. Prabal. The event was held on the 3rd of November 2016. It was judged by Mrs. Bipasha De and Ms. Aruna Mondal. The appointed moderator was Mrs. Joyita Banerjee. Subhash Chandra Bose House held a victorious first position in the event followed by a tie between Rabindranath Tagore house and Mother Teresa house in the 2nd position. Mary Ward house received the 3rd prize. The topic of the Hindi Debate was "Patriotism is more important than art". There were two participants representing the four Houses, one for the motion and one against. The moderator of our debate was Mrs. R. Sharma and the judges were Mrs. Osta and Mrs. Partridge. It was a very good experience for all the participants as it was the first time they participated in a debate. The topic was interesting and we had been discussing it both in school and at our homes. All participants were winners as they were able to put their thoughts across. The winning houses were Mother Teresa. The best speaker was Stuti Shaw. Hearing her name announced as the bets speaker she had tears in her eyes. The audience too thoroughly enjoyed the debate. Junior School Children's Day was celebrated in Loreto Day School on 15th October, 2016 in a grand manner. The programme was held in the Junior School hall. The day commenced with a prayer dance followed by prayers. A hymn was sung followed by a greeting song. A brief introduction as to why this day is celebrated was narrated to the students. Thereafter, the children viewed two interesting videos. The students were thrilled to see the teachers dancing on peppy numbers. The teachers also enacted a skit for their loving students. The children received light refreshments after which they went home in a joyful mood. On the eve of Diwali, our Principal brought the entire Staff together after the day's proceedings to spread the light of Diwali and dispel the darkness. She brought about a feeling of being united and working together as the family of "Loreto Elliot Road". We prayed together for each other when each staff member came up to the mike and prayed for the others with a lighted candle. The gathering came to a culmination when we viewed a video based on being part of a family and we sang in one voice the hymn "Bind us together". Teaching is considered as one of the noble professions that help an individual to shape their career as well as personality. The special day to honour the contributions of the teachers is celebrated in India on the 5th of September. 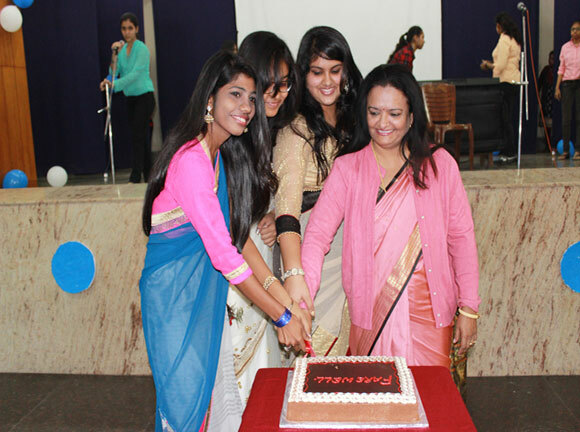 Loreto Day School, Elliot Road also witnessed the celebration of the teacher’s day. Though one day is not enough to appreciate and acknowledge their hardwork. But the students tried their best to make this day a special one for them. The day started with a mass followed by a short programme put up by the students. The theme of the programme was retro and it and comprised of a number of dances, fun and frolic followed by a greeting song. As a token of appreciation every teacher was given a card and a bookmark. It was great success to see all teachers enjoying their special day and making it a memorable one. 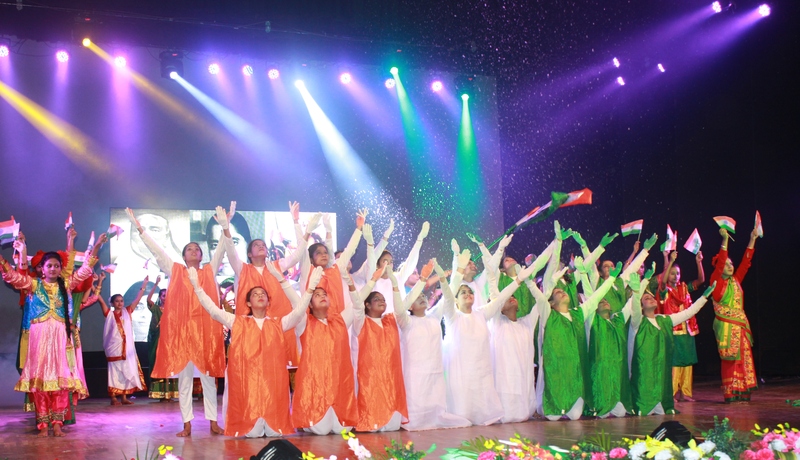 22nd and 23rd August 2016: The Loreto Elliot Road family joined their heads and hearts together for annual concert, Aazadiyan at Rabindra Sadan. Our concert was themed on how Mother India grew right from Indus Valley Civilization till the time we gained our Independence. From classes 6 to 12 were part of the concert along with our teachers and support staff. We have thoroughly enjoyed each and every moment spent in preparing the concert and making it all happen. The days of hard work and time dedicated to it was worth it when ‘Azadiyan’ was grand success. We’d like to thank each and every person who has helped us to make this a grand success and also our parents, chief guests and our lovely friends from other schools who were a part of the audience. “Aazadiyan 2016” was truly amazing plan devised by our teachers are carried out by us under their guidance. On 1 st of August, 2016 the Annual singing activity was held in a grand manner in the Junior School Hall. All the students from classes I to V had participated in it. Every class has two sections, hence each section sang a separate song. 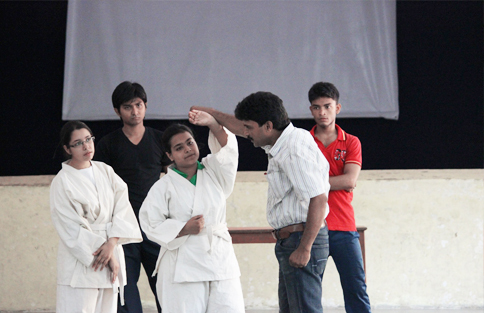 The students were trained by Mr. Dominic Saldanha. They sang classic hits which were all time favourites. The programme came to an end with Mrs.Prabal’s encouraging words. The songs sung by the students filled the morning air with hope and enthusiasm. 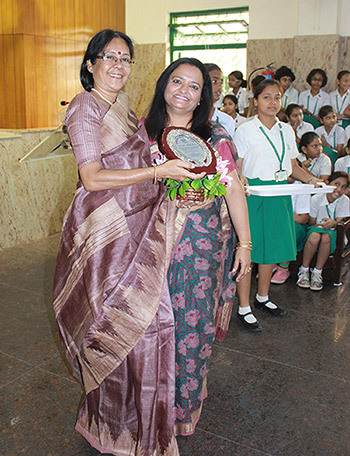 On the 29th of July the Junior School bid farewell to our beloved Mrs. Chopra who retired after twenty – two years of dedicated service. The programme began with a prayer dance and a prayer service. 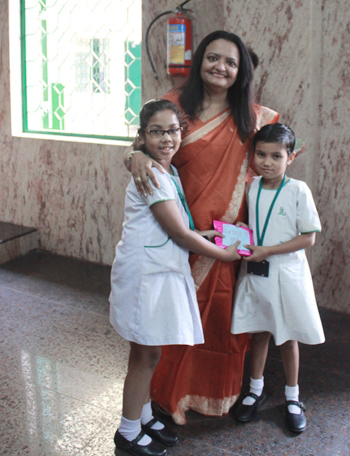 The students presented her with a bouquet and a card as a token of their love and appreciation. An action song by the little ones was followed by a skit depicting her positive qualities. A lively dance to feet tapping music was enjoyed by all. Thereafter a farewell song was sung. The programme ended with a powerpoint presentation highlighting some of her personal traits and sharing some of our happy moments with Mrs. Chopra. Mrs. Biswas and Mrs. Chopra expressed their heartfelt thanks and Mrs.Chopra shared some of her memorable moments with us through a powerpoint presentation. 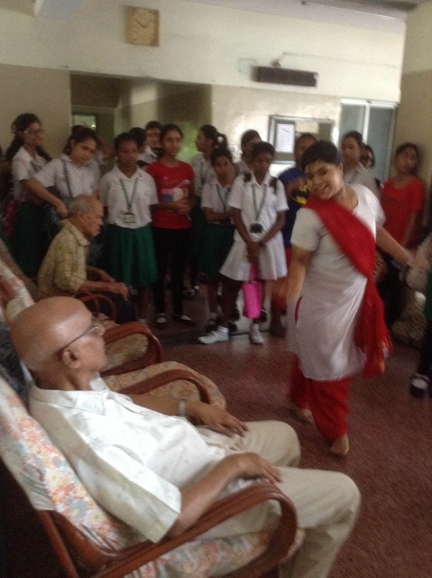 We, the Class X (ii) students had our outreach programme on the 14th May, 2016 at St Joseph's Old Age home located on AJC Bose Road. We assembled there at 9.20 am and our programme commenced at 9.30 am. We were carrying Tetra packs of Frooti for the inmates and was well received by the. The first half an hour we went around the whole Home. Sr Beatrice took time off to personally take us around and we interacted with some of the grandpas and grandmas. It amazed us to see how well the inmates are cared for and every attention to their well being and good health is looked into. The dining room, the library, the physiotherapy room and their rooms were spotlessly clean. With our arrival there, the sound of silence was interpersed with positive vibrancy of the rustling of our feet. We soon divided ourselves, as per our plans and rehearsal schedules. We performed four times - once in the men's section, and the remaining three times in the ladies section, spread across three floors. Whether it was the prayers, the vocals with the guitarist duo playing, the Bengali dancers, the skit girls or the Free dance group, each group was appreciated and the performance was applauded. The resounding claps brought smiles to our faces and our eyes lit up. In the end, we were all addressed by Sister Gloria who narrated a true life story and incident. This experience made us emotional and brought tears. We took a solemn promise that we would make sure that our parents and grandparents are always cared for and looked after by us. After sharing our experience with them, getting blessed by the grandmothers and grand fathers, we sang a closing hymn , after which we departed. This was our last outreach programme while in school as by this time many of us would have parted ways but the lessons and message that we receive and imbibe from school will never be forgotten. We thank our beloved Institution and all our principals- past and present for encouraging us and supporting us in our humble endeavours. This enriching experience has made us more humane, empathetic and sensitive and we earnestly hope we remain this way. 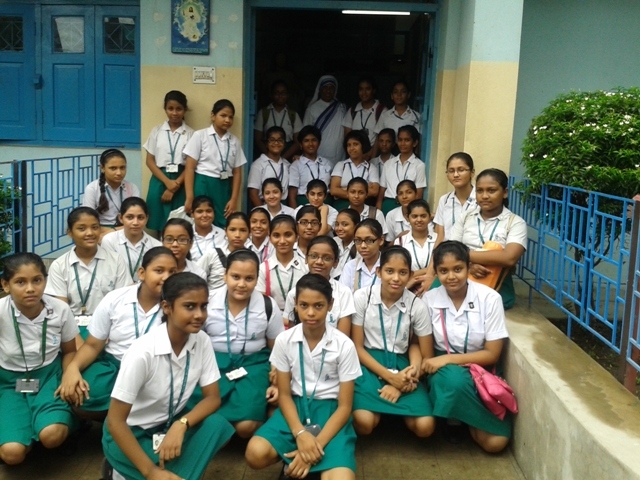 On the 16th of July 2016, Class 12 commerce students of Loreto Day School, Elliot Road embarked on a visit to The Calcutta Muslim Orphanage, as a part of their outreach programme. The programme was scheduled to start at 11 o' clock in the morning. It was a pleasant Saturday and as all of us gathered there, we were greeted with smiling faces of children. They all eagerly looked to see who had come into their abode. As we proceeded with the arrangements to start the programme, a couple of children ran to some of us and just hugged us. After the permission to play and interact with the kids was granted, we gathered around the kids, asked for their names and introduced ourselves. We observed their happiness as we distributed the gifts to these wonderful children. We started our programme with a prayer service which was followed by a group song. Some of the students called up the children and shaked their legs to get in tune with the peppy songs. Dance was followed by games. We were all smiles when we noticed the children playing with us. Such happiness we witnessed never before. 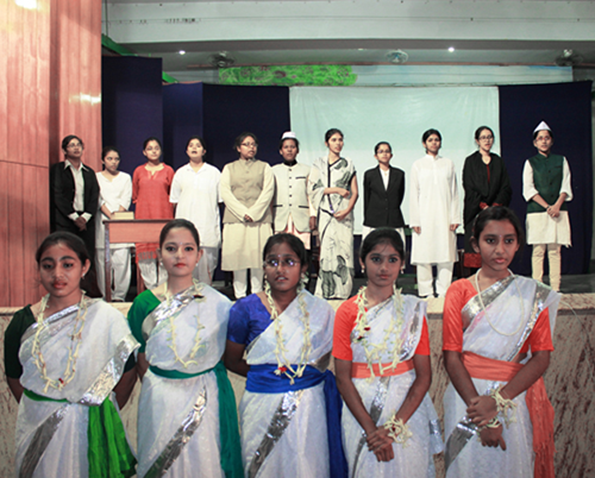 The programme ended with the national anthem sung by the children, the students as well as the staff. The joy that radiated from the kids touched us deep. We saw how much of a home they had, filled with lots of sisters. They were eager to play games, to sing and to dance. They were kids full of smiles eager to play and to pray. This visit has left a lasting imprint in our hearts. We are grateful to our principal Ma'am who gave us an opportunity to be there and our class teacher Ms Majumdar took the responsibility of accompanying us. On 16 th July, we got an opportunity to go out for an outreach programme in ‘PREMDAN’. We were accompanied by our class teacher Mrs.D.Roy. The children arranged biscuits from the money collected by them, for the inmates of the center. Our interaction with them consisted of singing and dancing. In turn they sang for us and entertained us. Through this experience we enjoyed ourselves. They had a lovely time with us, and we were successful in making their day a memorable one. Before we left the premises, they showered their blessings upon us and they reluctant to leave us. We would like to thank our Principal, Mrs Keya A. Prabal and our teachers for giving us this opportunity. At the end of the day we realize that we were fortunate to meet such people and go through this wondrous experience. The festival of the trees Vanamahotsav was celebrated on the 22 nd July, 2016 by the Junior school. Mrs. Maya Mukherjee was invited to grace the occasion. The programme began with a prayer service which was followed by an introduction on Vanamahotsav. 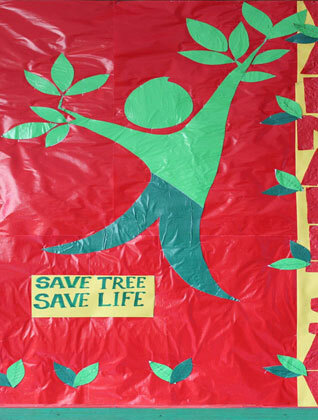 A short script was enacted to depict the historic Chipko Movement. A colourful dance on nature then followed; after which we had the planting of the saplings by the Principal, coordinator and teachers. Colourful rakhis made by the students were tied to the trunks of the trees in the school premises to strengthen the close bond that we share with nature. An informative video presentation on the importance of plants was also shown. 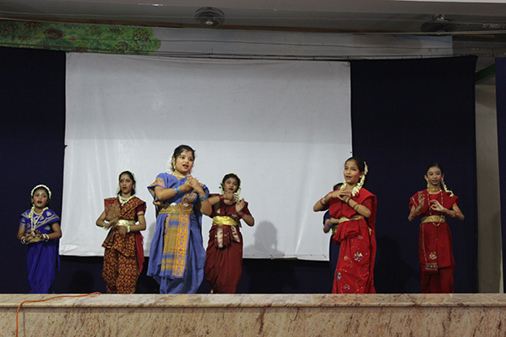 The programme concluded with the “Earth Dance” performed by the students of class V. They were joined by the Principal, Mrs. Prabal and Mrs. Mukherjee thanked all the teachers and students for putting up a brilliant show. They stressed on the importance of caring for our green friends every single day of our lives. A workshop for the parents of the middle school was conducted on the 25 th June, 2016. Which was chaired by Mrs. Alakananda Rai. The theme of the workshop was adolescent issues and problems and parents were guided as to the means and ways to handle the same. It was an enriching experience for the parents. On 2nd of July 2016 we the girls of 12H went for an outreach activity to All Bengal Women’s Union in Elliot Road. We had taken a few health drinks, biscuits & chocolates for the senior citizens and children. We were accompanied by our class teacher Ms. Handa. Our interaction with the inmates was an enriching experience, one that we will cherish all through our lives. On the 21st of June 2016, class 3(I) had put up an assembly to highlight the importance of managing our responsibilities ourselves. The 18th June, Saturday, the junior school hall was filled to capacity with the parents of the students studying in classes IX, X and Xi. The day began with a poignant prayer dance which was followed by reading from the Holy Scriptures with the translation in English. The greeting song sung by the senior most class was appreciated just as much. The audience were then welcomed by the Senior coordinator and the school principal, Mrs Prabal warmly introduced the day and graciously handed over the day's proceedings to Ms Alakananda Sen who is a councillor and attached with the NGO, Aftercare with Minors. Having mastered in Parenting style and exam anxiety in children before Board examinations, she spoke with conviction and real life situations and solutions. The presentation on the smart Board further strengthened the thought process. The last segment where the parents voiced their anxiety, she was forthcoming in her views and was supported with clear cut suggestions from Mrs Prabal. Thus, the day came to an end with the Vote of Thanks by the Principal of the school. On the 9th of May, 2016, the students of Loreto Day School, Elliot Road celebrated Rabindra Jayanti. The programme started with lighting of the lamp and prayer service to evoke the presence of God followed by graceful dances performed by girls of classes 8, 9 and 10. Characters from different plays by Tagore entered the stage which displayed the various topics on which he wrote. 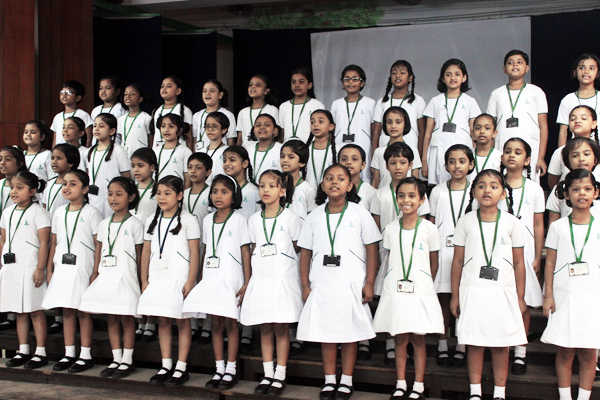 The programme ended with the Ntaional anthem sung by the entire school which enlightened our spirits with patriotism. Nursery Orientation was held on 6th April 2016 at 9:00 am in the Junior School Hall. The orientation began with a prayer dance followed by a prayer led by our Principal Mrs. K. Prabal. 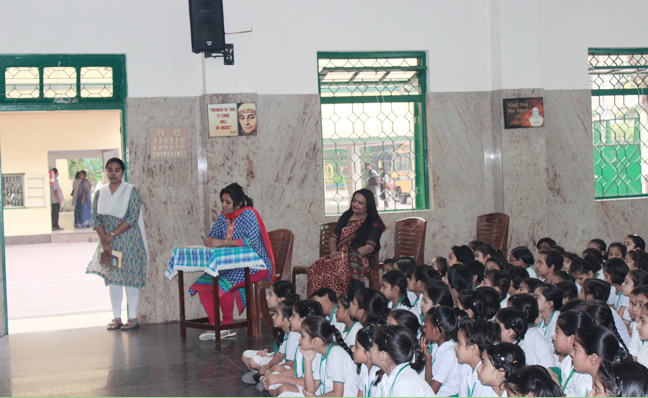 Mrs. N. Biswas, the Junior School Coordinator then enlightened the parents on the aim, vision and motto of the school. This was followed by the rules and regulations read by Ms. B. Williams and Ms. D. Lal. Our support staffs are rightly christened as they provide us with support though silent, through the year. It is thus but essential that we celebrate and acknowledge their immense contribution. 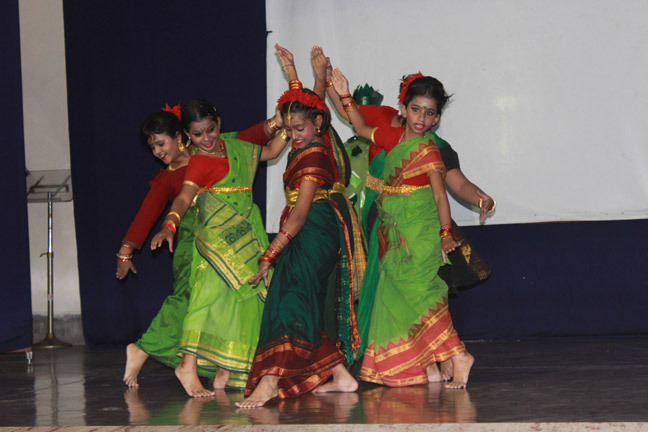 This year the programme included dance, song and skit, specially designed for our esteemed guests. The show ended with some inspiring words given by Robi Bhaiya. “ If your actions inspire others to dream more, learn more, do more and become more then you are a leader” by John Quincy Adams. 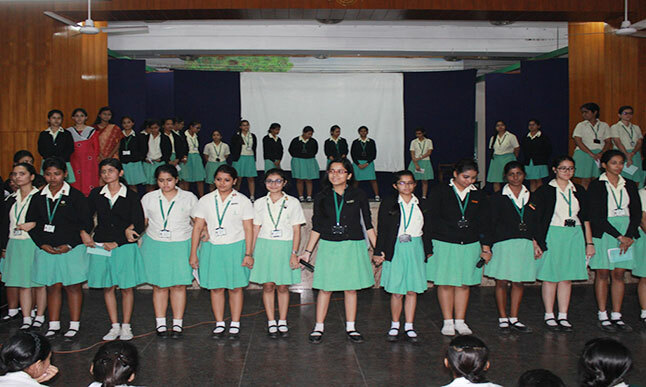 The investiture ceremony of Loreto Day School Elliot Road for the academic session 2016 – 2017 was held on the 12th of April 2016.It was held in order to honour the newly elected members of the student council by giving the badges to them. The ceremony was held with a lot of enthusiasm and gusto. It was initiated with the prayer dance followed by the lighting of the lamp. This was followed by an assembly conducted by the members of the student council. The assembly mainly focused on the importance of team work. It was followed by a prayer by one of our senior teachers Mrs. M. Mukherjee. The captains, prefects and monitresses were then handed over the badges. It was followed by the school taking an oath and thus promising cooperation. In response the student council took an oath where in they promised to carry out their duties with sincerity. 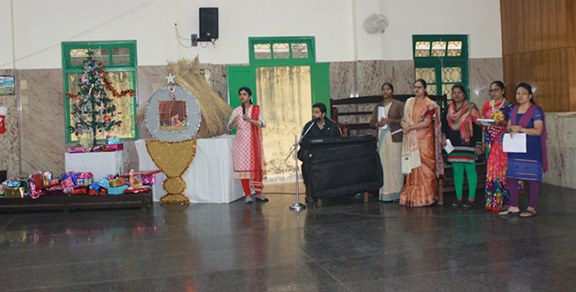 A number of hymns were sung followed by a speech by our Principal Ma’m Mrs. Prabal. It was a memorable day for Loreto Day School Elliot Road. In the view of the tremendous pressure of choosing a career in the context of a plethora of options available to the students, a workshop was conducted for the Board students. This aimed to ea the quelling of certain misconceptions and bringing forth a holistic understanding of career prospectus. A special assembly was organized in the Junior School Hall on 13th May, 2016 to bid farewell to Sr. Anupa Toppo . The programme started with a prayer dance followed by a prayer and a hymn “Count your blessings’’. Students then put up a meaningful skit on “Friendship” to depict that Sr. Anupa was a friend and a guide to the children. A Powerpoint presentation was shown portraying God’s immense love for us. The programme came to an end with a farewell speech delivered by Mrs. K. Prabal. 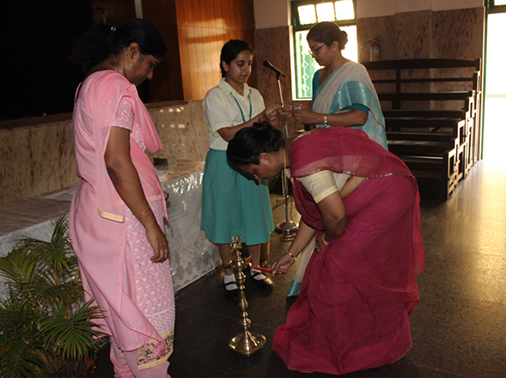 Sr. Anupa shared her experience in the school and thanked one and all for making her feel at home. A small treat was organized by the school in the Senor School Hall. A token of appreciation was then given to Sr. Anupa. The Principal and the teachers thanked Sr. Anupa for her selfless service rendered to the school and wished her good luck in her future endeavours. The month of May comes along and its time to pay homage to our beloved Mother Mary by crowning her as the Queen of Heaven and Earth. 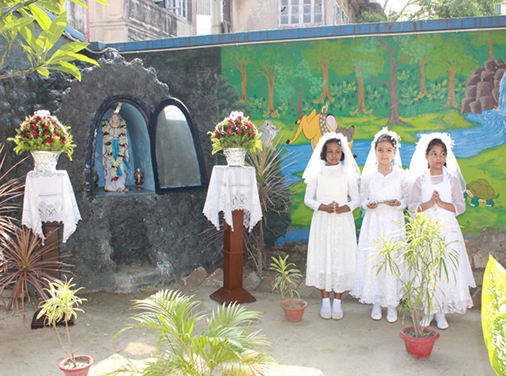 On 2nd May, 2016, Loreto, Elliot Road organized the ‘Crowning of Our Lady’ ceremony at the school grotto followed by the annual Blessing of the school. Three priests from St. Mary’s Parish, Ripon street, namely Father Mohandas, Father Niddhi Das and Father Peter graced the occasion. Catholic girls from class III onwards and all the teaching staff were present for the ceremony. 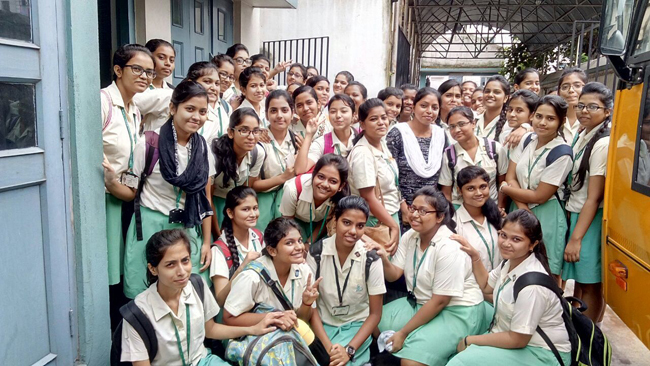 The girls of classes III and IV were sent on an educational trip to the Birla Industrial and Technological Museum on 6th May, 2016. Parents were instructed to drop their wards at the Museum at 9:30 am and pick them up at 12:00 noon. The four class teachers accompanied the children as they visited the “Children’s Gallery” first. They spent half an hour enjoying themselves and at the same time discovering the wonders of science. They were then taken to the auditorium for the “Egg – cell – ent” show hosted by Mr. Tarun Kumar Das as the name of the show suggests, it dealt with the wonder of eggs. The show was thoroughly enjoyed by one and all. 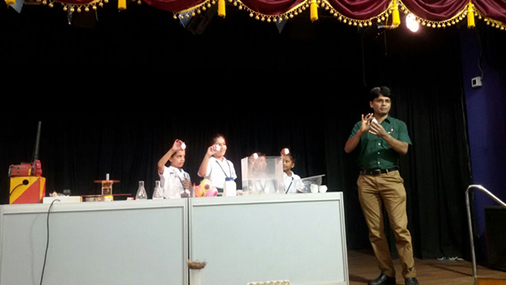 The children kept applauding Mr.Tarun as he kept them constantly mesmerized not only with the wonderful experiments but also with his sense of humour. It was indeed a wonderful experience !! An educational trip was organized by the school for the students of class 5 to BITM on 7th May, 2016. The students reached the venue at 9:30 am. 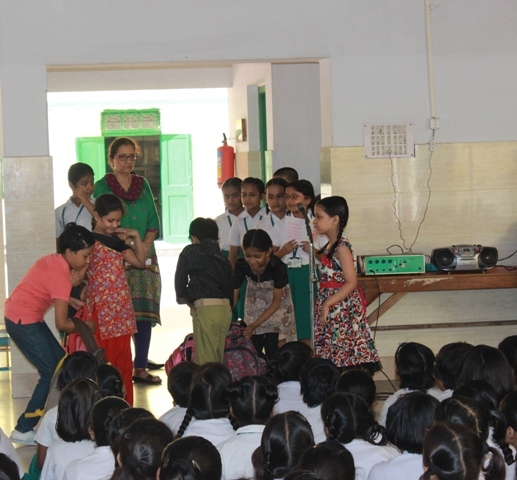 They were taken to the auditorium for the ‘Egg – Cell – Ent’ show presented by Mr. Tarun Das. Then they were taken to the ‘High Voltage Theatre’ or ‘The World of Electricity’. The students were mesmerized by these amazing shows. It was an enriching and enjoyable experience for all the students. 22nd March, 2016 - On the 22nd of March, 2016 the Junior School had their Annual Prize Distribution Ceremony for the Academic Year 2015 - 2016. It started at 9:00am and was held in the Junior School Portico. The programme began with a thanksgiving service conducted in Bengali; thanking God for the fruitful term, for our new Principal, for our teachers, our good health and safety, the various extracurricular activities, picnics and so on. 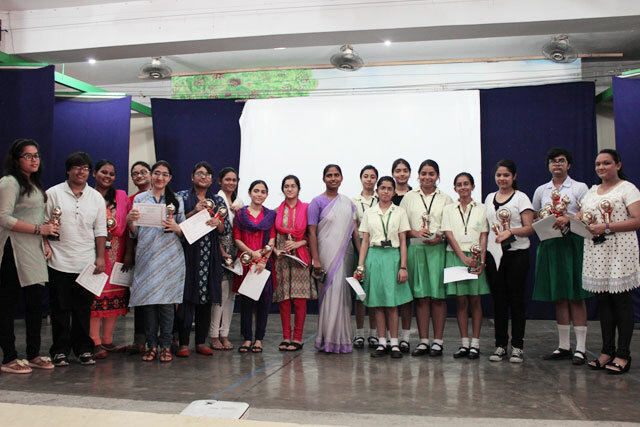 This was immediately followed by the prize distribution in which gold certificates were presented by our Principal Ma'am Ms. Prabal to the awardees from KG to class V. Five girls from each section came up to be felicitated as their names were being called out by their class teachers. 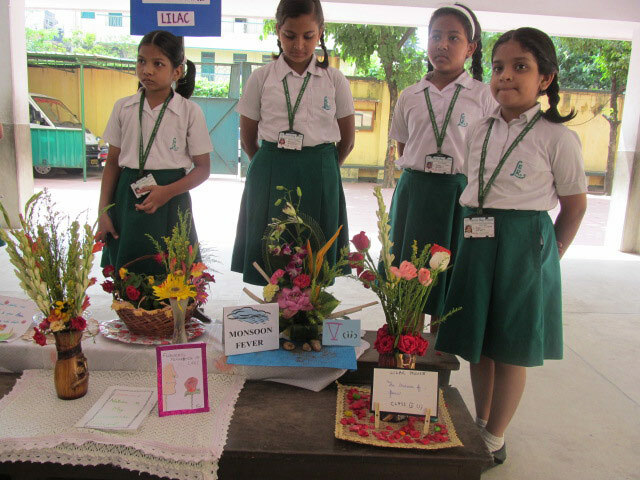 The winner for the best house went to Mother Teresa House and the runner up went to Sarojini Naidu House. It was indeed a moment of pride for the winners. The prize distribution ended with our Principal's address. From 14th March to 21st March 2016 Loreto Day School Elliot Road had its Annual House Celebration. The celebration started with Subhas Chandra Bose house followed by Mother Teresa, C V Raman, Mary Ward, Kalpana Chawla and Sarojini Naidu house. All the houses had started their programme with an assembly. Then the respective houses flaunted the talents of the house members in the form of dance, singing, acting, stand-up comedy and in many other ways. The duration of the programmes were about an hour which was thoroughly enjoyed by all. It was a collected effort of all the girls and the respective house mistresses with the support of our Principal Ma'am Prabal and our coordinators Mrs Govindraj and Mrs De. March 22, 2016: we ended our academic year 2015 – 16. As we bade goodbye to a wonderful sessions of ups and downs, the journey must go on. This journey saw many people leave and many new enter our lives. This journey saw many more smiles and even tears at times. This journey was another year full of memories that when once looked back would moisten our eyes. And as we began the last day of the academic session, we honoured students for their excellence in academics and various other fields. We congratulate each student, teacher and staff who have rigorously strived to reach another year of success. We hope 2016 – 17 will be a good one. On the 9th of March, 2016, the CEO of GOAL, Mr. Jhon Oshua from Ireland visited our Institution to spread awareness among the students of class 11 and 9 regarding ‘’ Social Entrepreneurship’’. He presented a video which summarised his travels as well as showed the object poverty prevalent in numerous parts of the world, including our Kolkata. He was funny and warm but through his words we come to realize how lucky we were to have loving parents, come to an esteemed institution and have teachers to guide us in a world where there are many who even have to fight vermin for survival. He spoke of people who have dedicated their entire lives for the betterment of society – people who were the match needed to start a revolution. He spoke of his own life, his travels and experiences. By the end, we were all touched and inspired. He achieved his goal of starting a fire within us to help others and inspired in us the desire to do our share for society. On 9/01/2016 Hindi extempore was organized for middle school. Four girls from each house participated. Different topics were given to each participant. Mrs.chopra and Mrs.Ali were invited as judges. Girls spoke very confidently. It was indeed a very nice and enriching experience. The class IXs and the XIs came together to organize the farewell of the outgoing batches of classes X and XII. This year, we thought of a light lunch packet instead of the snack box. The particular farewell cake and the lunch packets could not be organised without the immense support of our principal madam Prabal. Thank you ma'am we'll remain ever grateful to you. The programme commenced with a beautiful prayer service that consisted of a beautifully choreographed prayer dance, a power point presentation and prayers. Thereafter, the twenty pound chocolate cake from Cakes was cut by the Head girl, Vice head girl, Sports Captain and the Sports vice captain. 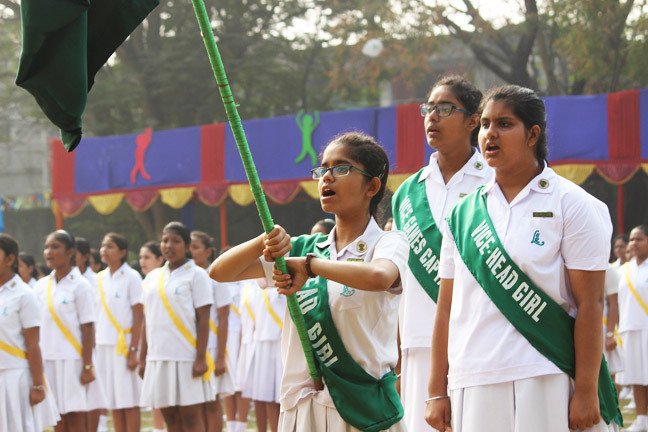 While the Mementos were distributed to the girls, the stage was readied for the class IXs who were eager to put up their first ever band performance for the school. In fact, the performers were all first timers and they rendered lovely melodies with the accompaniment of the synthesizer, drums and the guitar. While the performance was going on, the beautiful ladies of class Xs and XIIs, the teachers and staff were personally served mouth watering cakes, crunchy chips and chilled soft drinks by some of the students of class IX and XI. 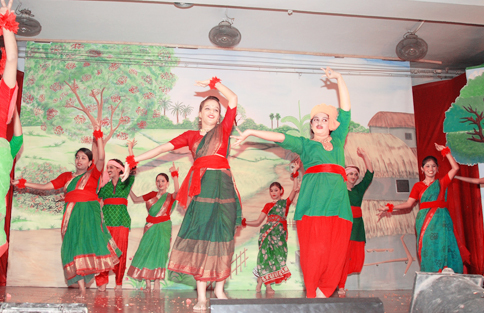 Soon after, this was followed by the energetic dance number by our very own talented dancers of the class XIs. We had the class XIs put up a few Western songs under the able guidance of Sir Dominic. The last item of the Day was a thoroughly well synchronized fusion dance recital by the class IXs. The Master of Ceremonies from Class XI then, came up to request our Principal to bid the final adieu to our role models. The event came to an end with the girls tapping their feet to some high energy and peppy numbers. At twelve noon, the lunch packets consisting of Vegetarian Haka Noodles and Vegetarian Manchurian were distributed to 199 students. We, the class IXs and Xs went into a cleaning spree and completed our task and responsibility to the best of our ability. We believe, we ended the 29th January 2016 event on a clean slate and with warm wishes and prayers for our outgoing batches of classes X and XII. 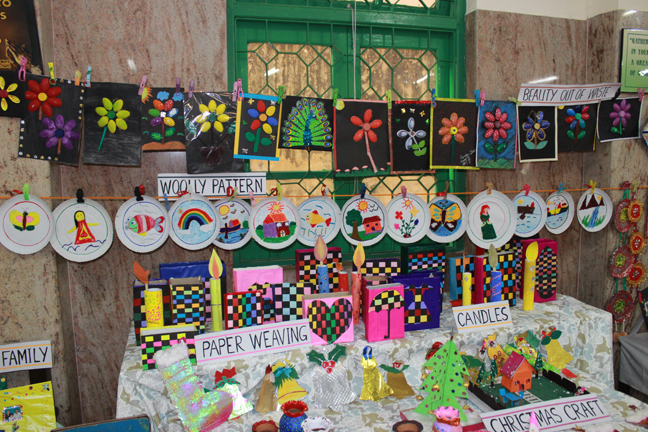 The Art and Craft Exhibition was held in the Junior school Hall on the 2nd of February, 2016, between 8:00 am to 12:30 pm. All the classes right from Nursery to class V had put up their beautifully prepared craft items. The hall bore a celebratory look as it was decorated with eye catching craft exhibits. The hall was buzzing with excitement as the beaming parents moved from class to class admiring and appreciating the work of their little ones. MARY WARD WEEK BY MIDDLE AND SENIOR SCHOOL. On the 27th, 28th, 29th and 30th of January we celebrated our founder's week, Mary Ward week. On the 27th of January we were told to make posters on the topic 'Freedom and Justice for Women'. We had got an hour to complete this activity. It was a house activity. Each class had to make six posters each. On the 28th of January each house had to prepare a presentation based on the maxims of Mary Ward, 'Seeing Good in all Creations'. In this activity each house had to submit one presentation each. Every house in its own way had interpreted and made their own presentations. Each house had done a fantastic work. On the 29th of January each house of each class had to make a best out of waste product. Anything that could be put to use in any way. We had got an hour to do this activity. And to draw an end to our founder's week we had had a mass for Mary Ward. It was good to see everyone coming together to do all these activities. It was a good experience. Everyone learnt how to work as a group. Above all everyone learnt how Mary Ward had worked hard to do so much for our society. She is an inspiration for us. We are proud to be part of such an institution. 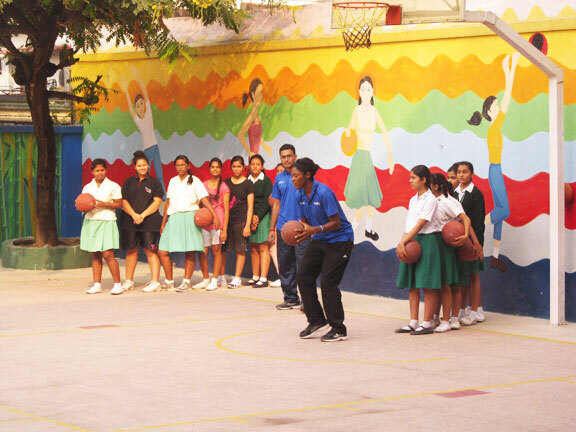 Jr. NBA and Reliance Foundation is currently undergoing a training programme nationwide for the development of Basketball in the country. We are also participating in the programme. On 13/01/2016 Ms. Nathalie Dionne Reshard came to our school along with Mr. Debasis Dey to train our girls. On the 29th January 2016, the students of class V had put up an assembly to pay homage to our school foundress, Mary Ward. It started with a power point presentation on Mary Ward’s early life and her contribution to the society. After this a skit was enacted on few famous maxims of Mary Ward. At the end prayers were dedicated to Mary Ward which ended with a hymn “Lead Us on Mary Ward”. All the teachers and students were deeply inspired by this assembly. A picnic for the Junior school children for classes K.G to V was organized on the 19th of January, 2016. Arrangements were made for them to go to Monobitan Park. The day was well spent by the children who were extremely excited. They shared food with their friends and enjoyed every moment. 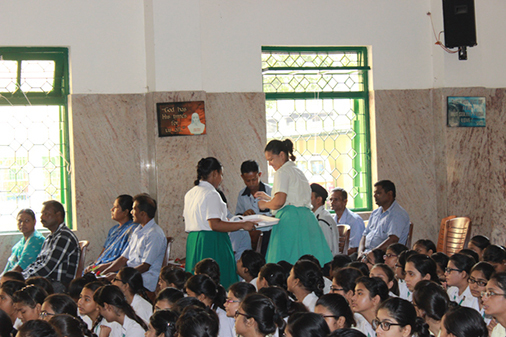 SPECIAL ASSEMBLY – CLASS IV In keeping with the observance of the Mary Ward Week this year, class IV put up a meaningful assembly on Mary Ward today; bringing out some of the qualities of the charismatic woman who was much ahead of her times. The qualities of courage, compassion, sincerity and her deep faith in God were dealt upon and through short classroom situations. The girls were shown how they could possess these qualities of Mary Ward and become more like her. The assembly ended with intercessory prayers and the ‘Lead us on Mary Ward’. Both the sections of XII’s had put up a joint program which consisted of a prayer dance, a short prayer service, a power point presentation, western dance and a combined skit by the two respective classes.The presentation was a comparison to Hogwarts and our school. It resembled that magic can be found anywhere, fiction is not just the only place. Our skit was based on the actual events which happen in our regular classes. Overall it depicted how we had spent our life in school for these years.Time was short, with only two days of practice. However we made it and it was a success. The event took place on the 20th of January, 2016 in our junior school auditorium. On the 20th of January 2016 the class X’s had put up their last assembly. 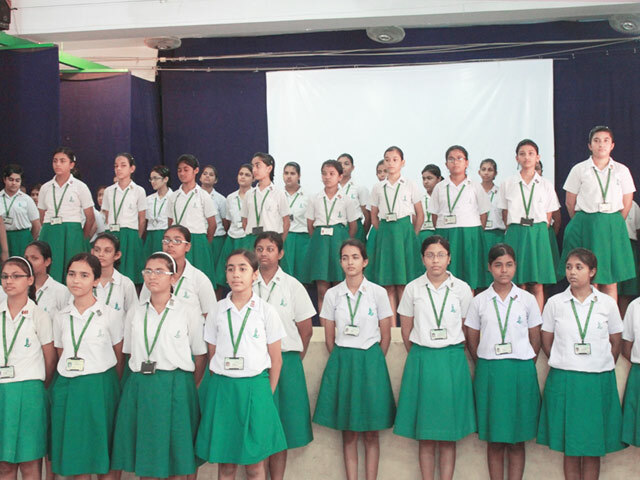 Both the section of class X’s had gathered together to bid adieu to their friends and teachers. Keeping up with the Loreto tradition we started our assembly with a prayer dance followed by a prayer service. We depicted all the memorable moments we had in the school through a skit. A power point presentation was put up which managed to win everybody’s heart. The assembly ended with a song – memories. The assembly was appreciated by all the teachers. 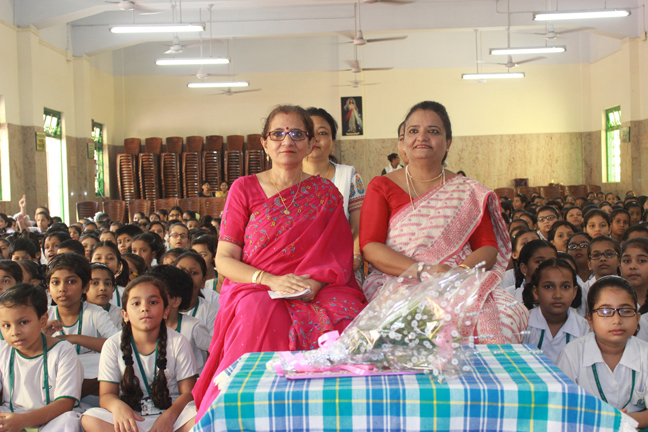 The concluding speech was given by Mrs. N. Bhattacharya and our Principal Mrs. K. Prabal. For all the students the last assembly was never about saying good. We took the last assembly as an opportunity to thank the school for its love, guidance and support. Nursery picnic was held on 19.01.2016 in the school premises. Both Nursery A and B came to school together. They enjoyed themselves as we had organized races and games for them. The winners received prizes for their effort. They also played in the park. They were excited to sit with their friends and share their tiffin. It was indeed a day filled with fun for each one of them. A special Assembly was held on 9th January, 2016 on the topic “Swami Vivekananda”. It started with a Prayer Dance - ‘nahi surya nahi jyoti’, written by Swamiji. 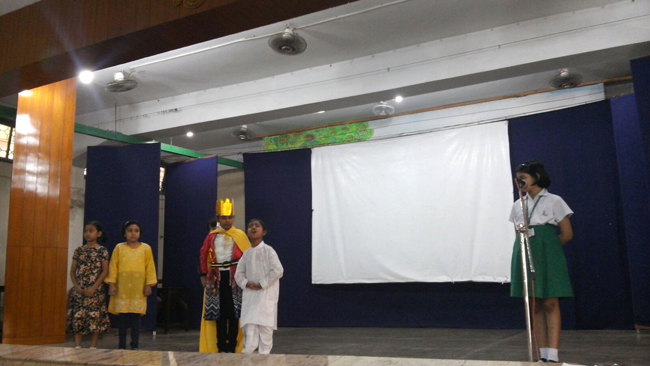 A Skit was then performed by Class – VII based on stories from his childhood. Quotes by Swamiji were then recited by the students. 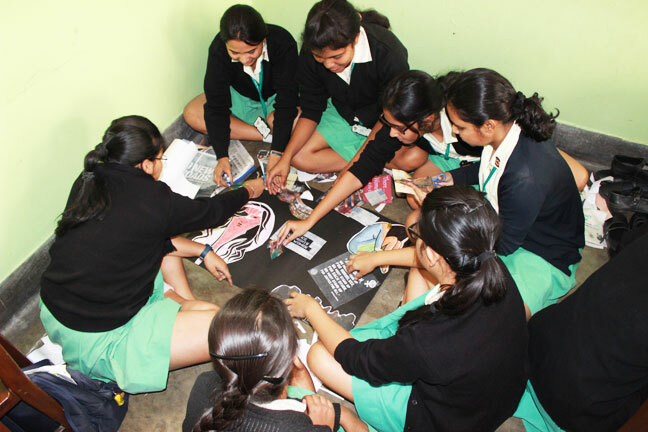 The resource persons came on 17th December 2015 to speak to the girls of class XII, regarding the course they are offering for the first time in their organization. They called it a One Step Programme Course whose eligibility criteria is that, the students should be a pass out of class XII. The programme details are there in the website and girls were suggested to go through it thoroughly before enrolling for it. It was an enriching career talk and things were explained thorough a power point presentation. The session was interactive. A token of thanks were given by the girls to the resource person. The Maths Olympiad organized by the SOF, was held in the computer lab for senior classes on the 10th December, 2015. The children are judged on the basis of their performance in subject Mathematics. 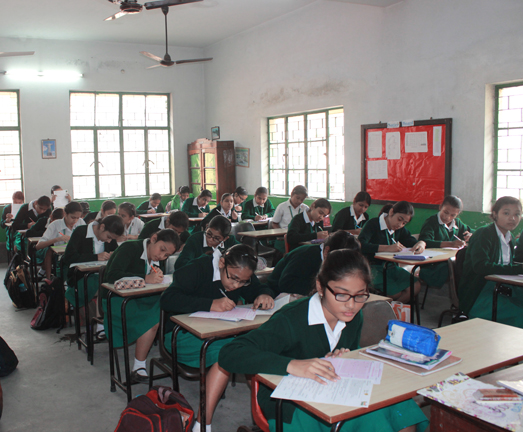 On 6th January 2016 a quiz competition was organized by Smart Q for the girls of classes V to IX. 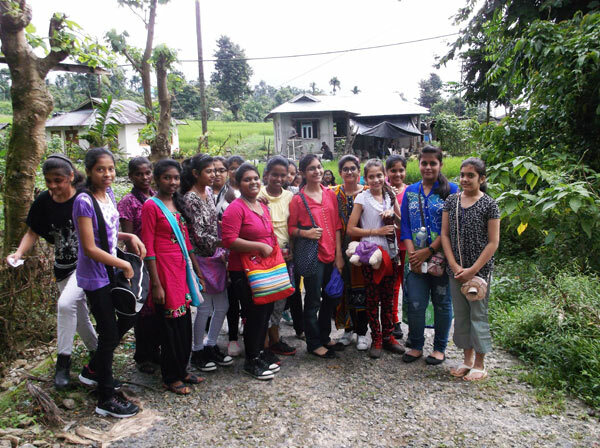 The girls had an enriching experience. 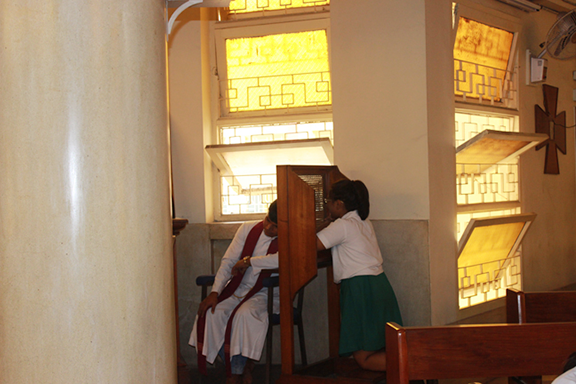 The school organized a Penitential Service during the season of Advent on 9th December 2015, for our Catholic children from class IV – XII. This was arranged in St.Mary’s Church Fr.Saju took us through a process of preparation before the confession were heard by a few priests from the neighbouring parishes. We take the opportunity to thank all the priests who so generously gave off their time by supporting us in the endeavour . 18th December 2015, was the last working day before closing for the much awaited festival of the year........Christmas. The school gave over at 1pm for the children after which the teachers prepared themselves for their own share of fun.. Washing their hands off all their file and practical corrections the teachers do their final touch up for the Christmas party. A short prayer service marked the beginning of the Christmas party followed by carol singing....Christmas is all about sharing. Teachers participated in the chain game of 'secret Christmas friend' were they both gave and received gifts. Music, pictures, and mouth watering refreshments culminated the beautiful day. 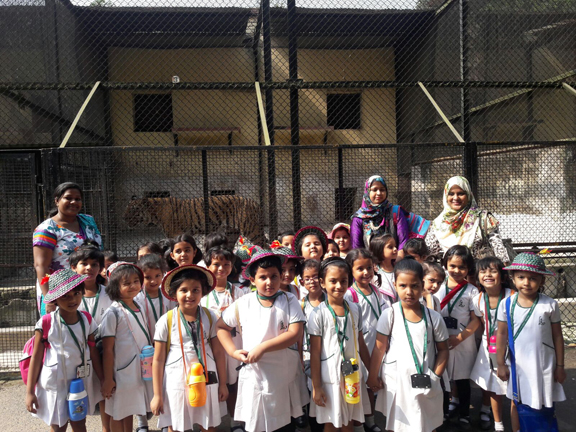 The Nursery children went to the zoo on their educational trip on 27th November 2015. They were accompanied by their teacher’s and six parents. The children reported at 8:45 am. They went around the zoo and were very excited to see so many animals and to know more about them from their teacher’s. The children then sat at a spot and had their tiffin. They were dismissed at 11:00 am. The children enjoyed themselves and it was a wonderful experience for the teacher’s too. 19th December 2015 Loreto Day school, Elliot Road celebrates Christmas tree for some of our children. A meaningful prayer service marked the beginning of the day followed by sports for the children. The children were oozing with joy as they were all competing for attractive prizes. They were super – excited as they are all geared up to welcome Jesus into their hearts the advent Mass added significance to the day followed by the Christmas skit performed by our very own girls. The day ended with refreshments which included mouth watering CHRISTMAS CAKES. 18th December, 2015 was not only the last working day of the year 2015 but also the day to put up a Christmas programme for the children. As always the children were looking forward to this programme as they get an opportunity to sing the carols that they have been practicing and also get to witness the Nativity story. The programme began with a short introduction to the skit titled “Love – the greatest gift to Man”. The skit shows Santa Claus relating to two sisters the story of Christmas and bringing out the fact that Jesus Christ was the greatest gift from God – a gift of LOVE which he sent us and died for us, so that we could hope to be with God in Heaven some day. After this meaningful skit, the plus 2 girls sang a couple of Christmas songs and kept the children enthralled with their beautiful voices. They also sang a Christmas greeting song and the audience joined in. At the end, our Principal, Mrs. K. Prabal, expressed her gratitude to the staff and students. 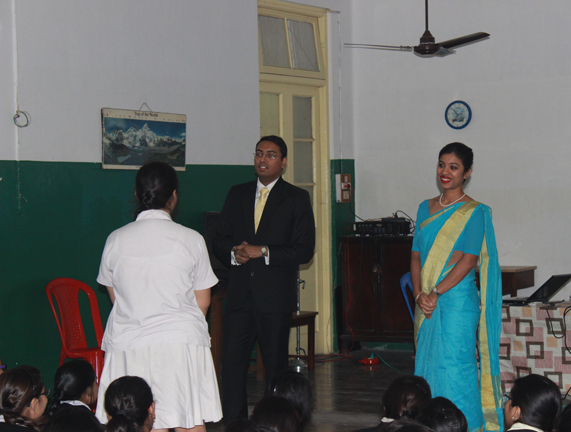 This programme was also put up for the senior school. On 16th December'15, the girls of class 11 & 12 went to Ibiza along with Mrs Quadra, Mrs Sharma, Ms Handa and Ms Majumdar.It was great fun and an amazing experience. Time well spent with a group of awesome people. From the bus journey to Ibiza to the bus journey back to school , what immense fun! Every moment spent is now a memory- a memory which will now be cherished and remembered always. It was the last school picnic for the 12s, as they now journey onwards with their upcoming exams, the family of Loreto Elliot Road wishes them all the very best. May they all excel and prosper in life. 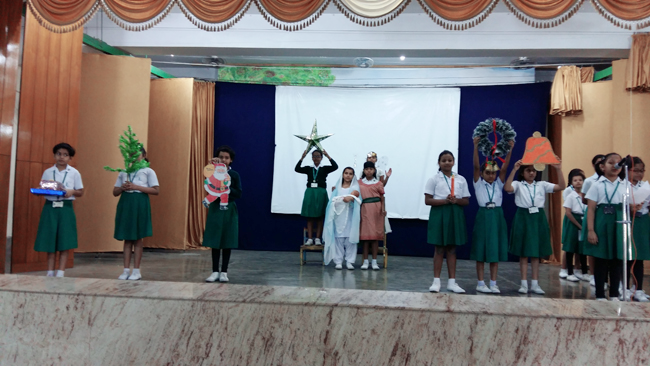 Christmas is in the air and so on 17th December, 2015, class IV( 1 ) put up a short assembly on the significance of some of the symbols of Christmas. Many of these symbols are used as decorations and we are not aware of what they really stand for. The crib, star, angel, Christmas tree, Santa Claus, gifts, wreath, candles and bell were displayed while their significance was read out. The assembly ended with a prayer thanking God for sending his son Jesus for us; and a carol – Long time ago in Bethlehem. The value of honesty was depicted through an assembly put up by the students of class III (ii) on the 24th of November, 2015. A skit based on the theme was followed by prayers and hymn singing. The last set of Mini Sports for the junior school was held today the 17th of December 2015 in the Junior school grounds for classes IV and V. Our Principal Mrs. K. A. Prabal was invited to witness the event which began at 8:45 am. We began with the individual races and pair races. 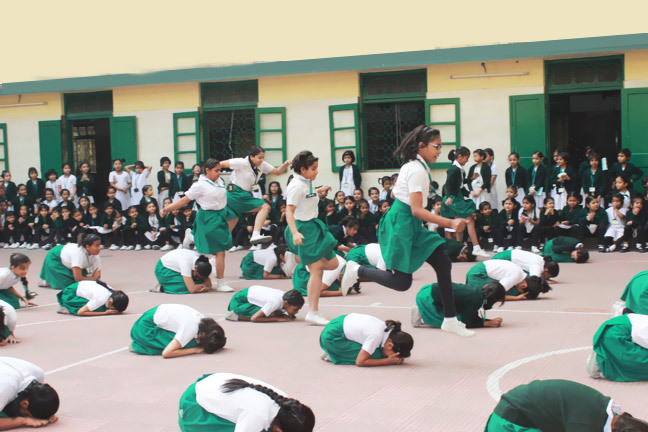 Class IV(1) put up ‘skipping to success’ (skipping race); IV(2) – “United we walk” (Three – legged race); V(1) – Blowing the Balloon and V(2) – Balancing the book. Both the sections of class IV also put up flat races. Then we had the Group races: IV(1) – “Come on Barbie, Let’s go party” (Dressing the doll); IV(2) – “ It’s time to hop like a frog”(Frog race) V(1) – Crossing the hurdles and V(2) – Shoe race. After these events girls of classes IV and V who learn karate, displayed their talent in this sport. We then had a race for the teachers – the tree – legged race. 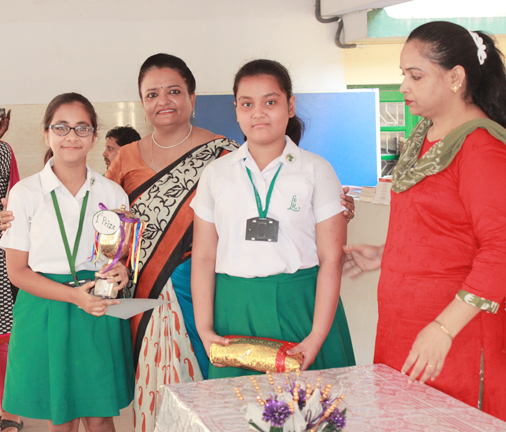 The first place was bagged by Sr.Anupa and Mrs.M.Khalko and the second place by Mrs.R.Ireland and Mrs.R.Nathani. The day ended with the prize distribution. It was evident, looking at the bright smiling faces of all , that everyone had thoroughly enjoyed the day. 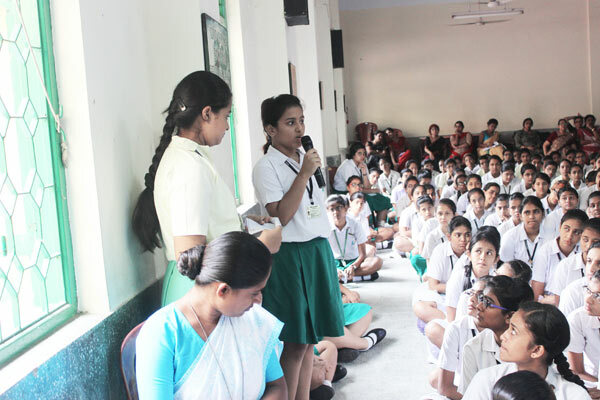 Kolkata Quiz was conducted by Mrs.R,Osta. 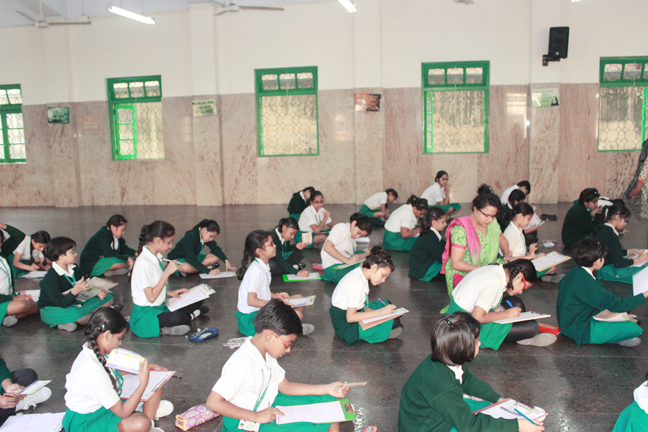 The International Talent Hunt Olympiad organized by the Silverzone Foundation , was held in the Junior school for classes I – V on the 16th December, 2015. The children are judged on the basis of their performance in subjects such as Language, Science and Mathematics. 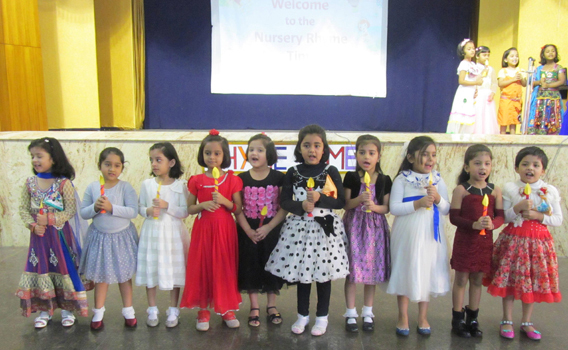 On the 10th of December 2015nursery put up a programme for their parents – Nursery Rhyme Time. We started with a prayer song – “This Little Light of Mine”, followed by the recitation and singing of rhymes. A child from each section narrated the story “Three Little Pigs” while few others spoke about their favourite toy or favourite fairy tale character. An audio visual presentation on the activities of the children was shown. The programme ended with our Principal Mrs. K. Prabal sharing her thoughts on the days events. 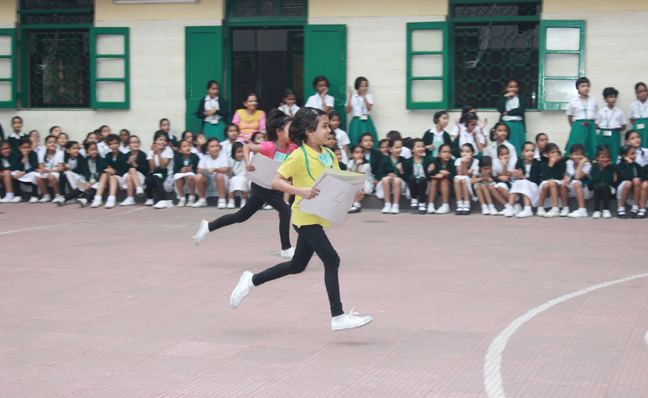 Classes KG and I of Loreto Day School, Elliot Road had their Mini Sports on 14th December, 2015 at 8:45 am. Each classes had individual, pair and group races. All children of KG and I participated in the sports. Classes II, III, IV and V along with their class teachers were the spectator who cheered the participants. Our Principal, Mrs. K. Prabal was invited as the chief guest of this event. Mrs.R.D.Osta, Mrs. M. Partridge and Ms.A.Mondol were at the finishing line to decide the winners of the different races. Mr.D.Saldanha kept the crowed lively with his entertaining comments. At the end of the sports, prizes were awarded to the winners by our Principal. 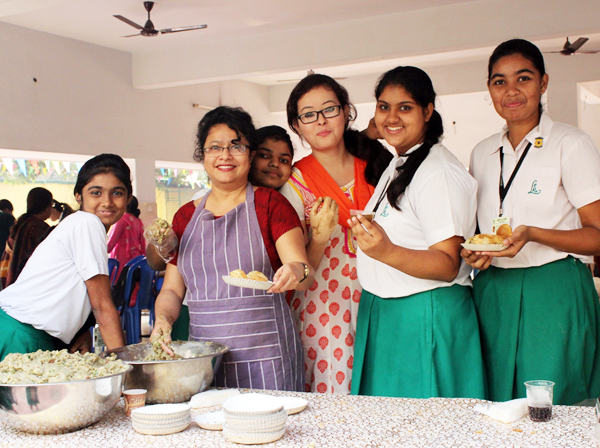 We would like to thank our Co-ordinator, Mrs.N.Biswas for her constant help and support during the practice times. 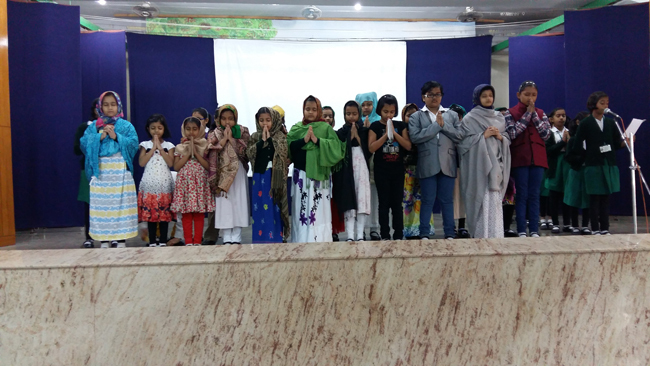 On the 7th of December, 2015, the second language Hindi Recitation Activity for the Junior School was held in the school Hall. The hindi students of both the sections of classes I to V came up very confidently to recite their poems. 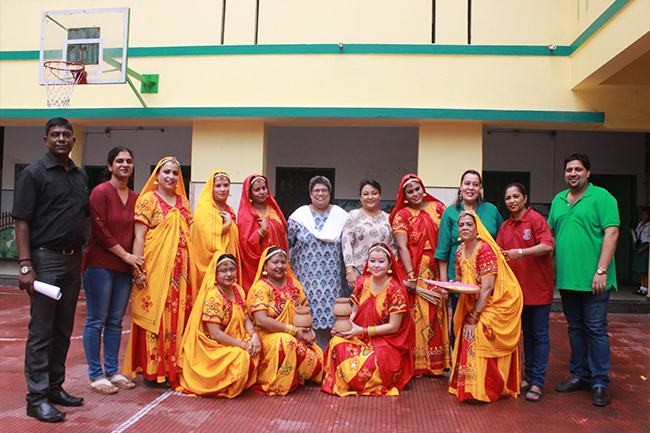 The event was judged by two senior school teachers, Mrs. R. Sharma and Ms. Pandey. It was a lovely learning experience as a wide variety of topics was covered by the different classes. Both the judges in their addresses, encouraged and praised the children and the audience applauded cheerfully for the winners. 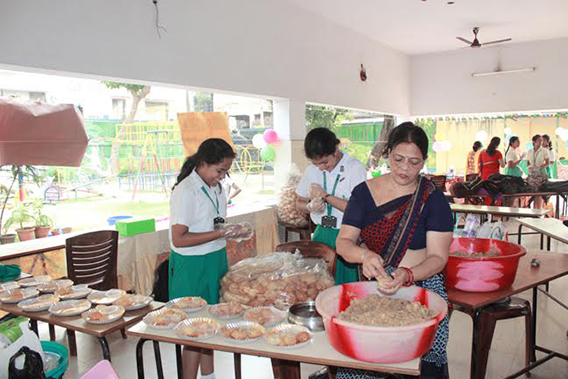 On 12th December'15, the Loreto Elliot Road family organized it’s Annual Mini Fete which consisted of a variety of stalls ranging from the game stalls to the funky tattoo and computer gaming stalls to the cool disco to those stalls of lip smacking heavenly delicacies. The grounds of Loreto Elliot Road looked so colourful with the little children playing and their parents smiling. The air was engulfed the people with happiness and mirth. Our ground was home to all the lovely people who spent their valued time making our fete a grand success. We had a ridiculously amazing time. We would love to express our heartfelt gratitude to all those who have contributed in every possible way. This wouldn't have been possible without the support of each one. Thank you everyone, we remember you and your family in our prayers. 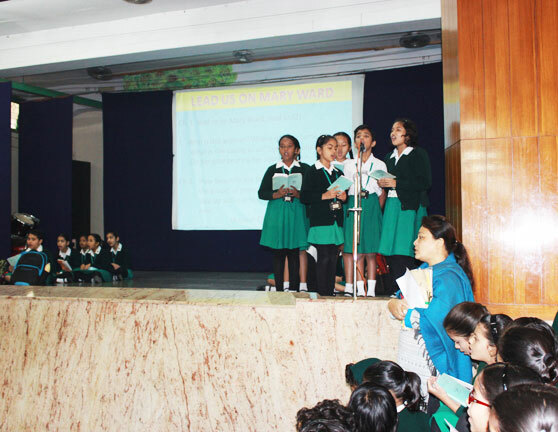 The English Elocution Activity for the Junior school was held in the hall on the 15th of December 2015. The Activity was divided into two groups. Classes I – III were the participants of the first group whereas classes IV and V were members of the second group. 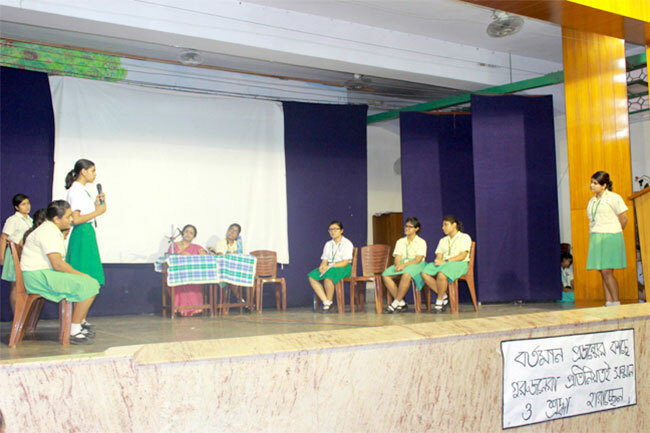 The Elocution was judged by two teachers of the senior school staff Mrs. A.Rocha and Mrs. S. Gomes. As the event progressed, each and every class came up to recite their well chosen poems. It was heartening and delightful to see the little ones showcasing their talent so confidently. The judges shared their opinions and also praised the children. The vote of thanks was given by our respected Principal, Mrs. K. Prabal. This was followed by the prize distribution. The Junior School arranged a Bengali Elocution Competition on the 9th of December, 2015 in the Junior school hall at 8:30 am. 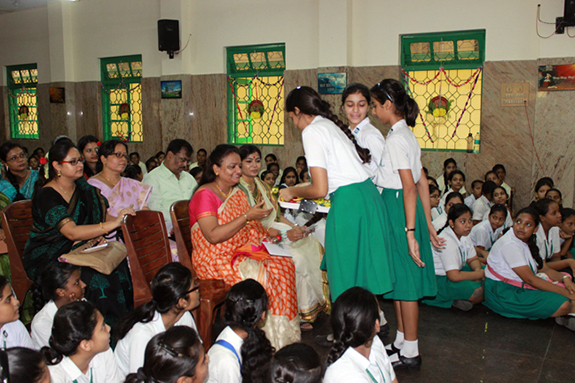 Mrs R.Ghosh and Mrs. J. Banerjee from the Senior School were invited to be honourable judges for the day. The Bengali students from classes I to V participated in this competition. It was a huge success. The girls won the praises of the judges and the audience as they were simply perfect in their delivery and presentation. Class III from Group A and class IV from Group B were the winners. Our Principal Mrs. K. Prabal, expressed her appreciation to the students and the Bengali teachers, and her gratitude to the judges. In an English medium school where Bengali is a second language, such an initiative was truly noteworthy and commendable. 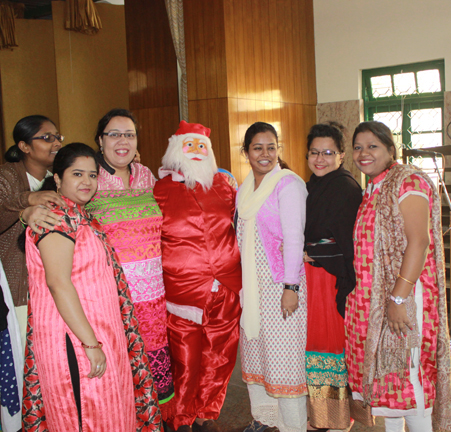 On the 4th of December, 2015, Loreto Day school had organized a farewell for one of the most experienced and amazing teacher, Mrs. Barua. To honour her service of more than 3 decades, the programme began with a song by one of the students of class eleven followed by a prayer service. This was then followed by a classical dance performance. 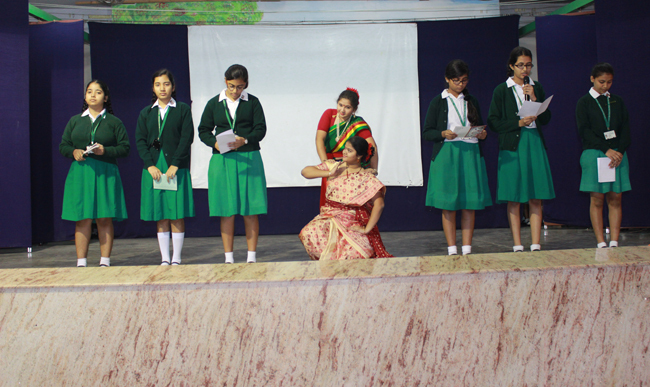 A skit depicting the various good and generous qualities of Mrs. Barua was put up by the students of class eight. Then, there was a poem presentation on her journey in the school followed by a solo classical dance performance by a class eight student. The programme ended with inspiring speeches by the principal and a few teachers dedicated to Mrs. Barua. It was finally time for Mrs. Barua to bid adieu to all of us. The programme ended by honouring Mrs. Barua .The programme was a huge success. The Senior School Sports of Loreto Elliot Road, was held on the 5th December, 2015 on the sprawling grounds of Loreto Convent Entally. The renowned golfer and Loreto Alumni, Ms Vandana Aggarwal as the Chief Guest, was among us, and in the midst of all the Loreto sisters, esteemed guests, the School Principal, Mrs. K. Prabal declared the Sports open. The Torch was taken around the grounds by our Vice Captains while our Captains released the pigeons and our Prefects released the balloons. Our six House Captains led their respective Houses with the perfect salute reserved for the guests. The Head Girl, Vice Head girls, the Sports captain and the Vice Sports captain showed through their marching that this indeed, would be Sports with a difference. The performance of the Army Band made a huge difference and taught us all what discipline and coordination was all about. The success of the band was gauged by the thunderous applause. PULSE saw the coming together of beat, rhythm, fun and excitement where we saw each student from class VI to XII participating in some race or the other. The class races section wise saw the window opening for every single child and the parent on the field beamed with pride. Meanwhile, the fastest competitors fought it out, strong and fair on the grounds through their relay and flat races. The Sports saw various races- for the teachers, parents, ex-students, support staff and an inter-Loreto event. Each of these brought laughter coupled with a healthy spirit of competition. The Rainbow children of the school put up a spectacular drill display and also exhibited their expertise in the martial art, Karate. The other three drills saw the children in colourful attire and each drill had a different prop to go with it. The coordination and rhythmic steps was truly magnificent and no doubt we saw the proud parent cheer for his / her child. The event drew a close with the entire school on the field. That was indeed a proud moment for the Principal, teachers and all present. The loudest applause and appreciation went to Mrs S Gangopadhyay who tirelessly over months got the 666 students to perform. The Vote of Thanks by Mrs. K. Prabal, our Principal was truly all encompassing and she made sure that she acknowledged all present. This spectacular show thus came to an end with yearning of more such sporting events in the coming years. On the 23rd of November 2015 girls of classes 9-12 put up a presentation commemorating 26th November. The Day of the constitution. The programme began with a dance, with a simultaneous power power-point presentation and enactment on the stage, showing the making of the constitution. At the end of the programme the entire middle and senior school stood up and together said the preamble. On the 15th of November, the YCS girls of Loreto Day School, Elliot Road of Class 10 had gone for a pilgrimage to BANDEL church. We were accompanied by Mrs.Rocha, Mrs.Partridge and Mrs.Govindraj. We had to reach Howrah station at 8:15 am. We boarded the train at 9:00 am. We reached Bandel station at about 9:45 am. After we reached the church we went to the top of the church and recited the rosary. Visited the statue to pray the Rosary. We prayed over there and burnt candles. Then we had attended the Sunday Mass at 11:00 am. After that we had lunch which was provided to us by the YCS Community. Then at 2:00 pm we left Bandel Church to board the train for our return where our parents were waiting for us. This was a spiritually enriching experience for us. An educational tour for the students of class V’s was organized on 20th November’15 to Netaji Research Bureau commonly known as Netaji Bhavan. 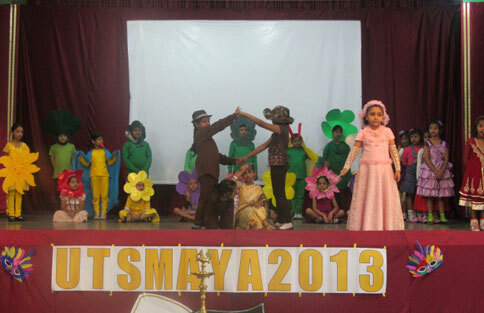 The children were accompanied by their respective class teachers. Children eagerly waited to enter the ancestral home of Netaji Subhas Chandra Bose. This bureau is a biographical museum organized on the basis of the most amount of materials pertaining to Netaji collected from various sources. It displays the personal belongings of Netaji and his family members. Portraits of Netaji with other contemporary leader of his time were exhibited in the gallery. The children also witnessed the secret staircase from where Netaji fled in January 1941. Netaji Bhavan is a storehouse of information. 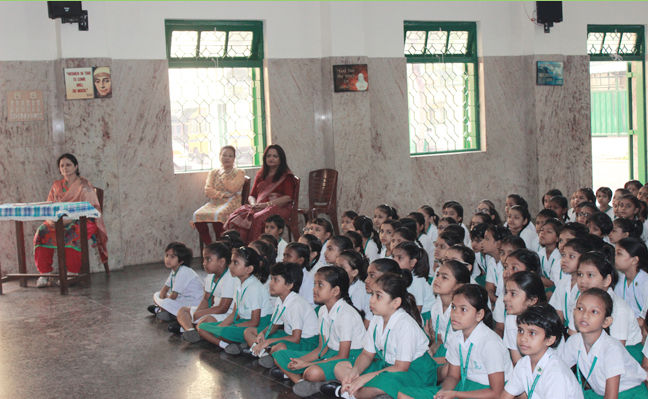 It enlightened our pupils with knowledgeable facts on the life and work of Netaji. It was an enriching experience for our children. On the 20th of November, we, the girls of Class 11 & 12 went for an educational trip to Science City. We were accompanied by our class teachers. It was a great experience and we had a lot of fun. It is really fascinating to see the wonders of science and also how science prevails in our day to day lives whether we are aware of it or not. We also saw a 3D movie and went through the evolution tunnel where we saw models of dinosaurs and how the evolution process went on and lead to the evolution of early man. Science is a miracle worker that does so much to enhance our lives. We all had a gala time and even got to see and learn a lot from today's experience. Loreto Elliot Road has always been making Children’s Day as a grand fiesta. 2015 was no exception. 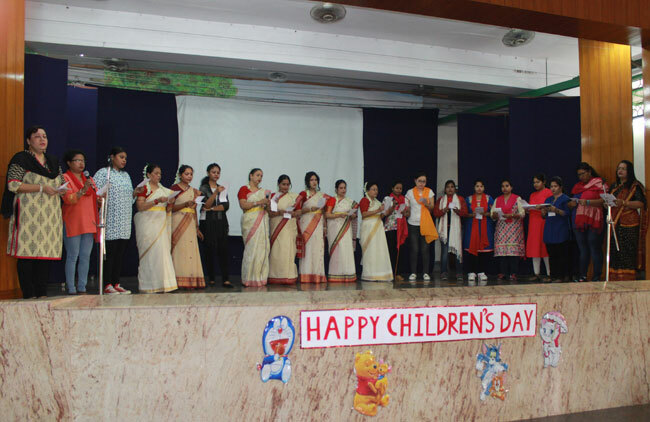 The school celebrated Children’s Day with immense joy, enthusiasm and magnificence. The school looked like a hub of gorgeous young girls with colorful clothes. The students were enlightened with a prayer service, a fun filled skit and were thoroughly entertained by the dance performance by the teachers. The teachers also had lend their voices to a Melodious greeting song much to the delight of their dear students. The programme ended with the golden words of Mrs. K. Prabal. 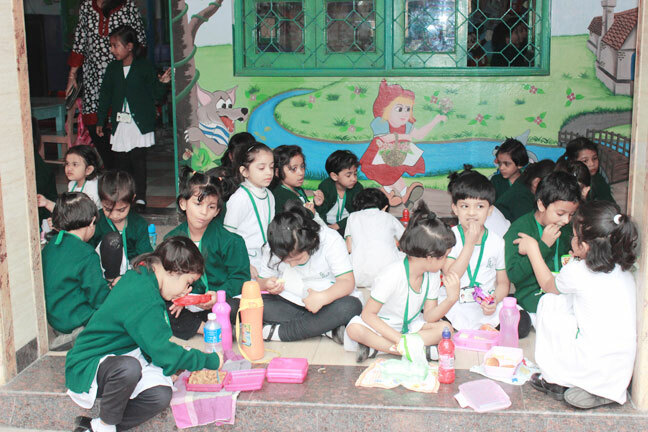 The students were treated with crunchy corn puffs and mouth watering ice – cream. A great day indeed for both the students as well as the teachers. This year Children’s Day was celebrated on the 17th of November. The junior school teachers put up their programme at 8:00 am in the junior school Hall. The day began with a prayer service. There was reading from the Holy Bible read out by the Principal, Mrs.K.Prabhal in which God urges us to become like little children if we want to go to Heaven. This was followed by intercessory prayers imploring God’s blessings on the children, their family and their children all over the world. The prayer service ended with the hymn “count your blessings”. After the prayer service, the children were shown short video clip giving out a strong message. While they were watching this video, the teachers were getting ready to set the stage on fire!! Since the children had recently been a part of the concert on ‘Cinderella’, the teachers put up a spoof on this fairy tale. The hall reverberated with the children’s laughter, they thoroughly enjoyed every moment of it. This skit was followed by another five minute video which the children watched keenly as they waited for get another performance by their beloved teachers – this time a dance! 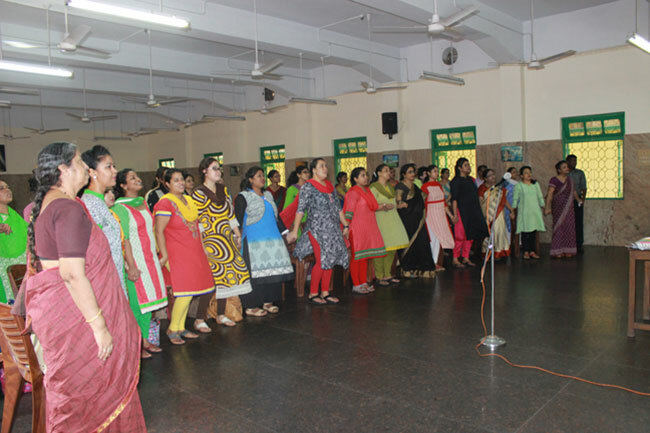 The teachers danced to a medley of four songs and the children couldn’t but help react the way they did – clapping, singing and getting themselves into the groove. The day’s programme ended with a greeting song sung to the tune of the hit pop song, “Doing that thing you do”. The children were given an ice cream cone and a packet of dalmoot. They were extremely grateful and appreciative of what the teachers had done for them. On the other hand the teachers were happy to see the children happy. A Pollution-Free Puja is a dream we wish to make true and so on 9th November in the audio-visual room, the students of classes IV and V displayed a number of models, charts, power-point presentations and short skits depicting various ways in which one could prevent air, land, water and noise pollution during festivals specially during Durga Puja. From the need to use biodegradable components in making idols to the use of dustbins at every nook and corner, and from the use of low-decibel sound systems to the organization of smooth movement of traffic - all were well portrayed. 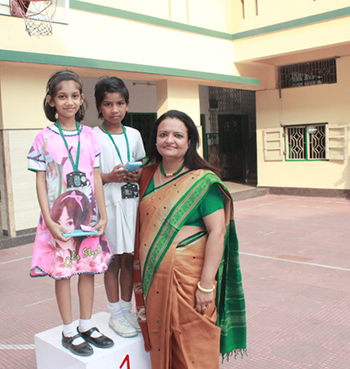 The Principal, Mrs. Prabhal said the exhibition was informative,creative and well done. Ma'am also expressed her gratitude to the staff and students for the trouble and hard work they had put in. This exhibition was organized with the intention of making children aware of the amount of pollution caused during festivals and to encourage them to come out with innovative ideas to prevent this pollution. The 2nd November , 2015 was an important landmark as Loreto Elliot Road ushered in a new era where a major transformation took place. We were now going to be led by a lay person. For this special occasion, we decided to keep the welcome service straight and simple. As per the Loreto tradition, we believe that the blessings of the Almighty is the most essential component. Our programme began with the blowing of the conch shell followed by an introduction and then a quote.The welcoming segment consisted of the giving of the bouquers and garlanding our esteemed guests.The prayer service commenced with a beautiful fusion of Bharatnatyam and Kathak. The powerful video called the 'Prayer' was touching. The four readings from the Holy scriptures , The Bible, The Gita, The Quoran and The Guru Granth Sahib were appropriate to the context. Thereafter the Hymn was sung and the programme ended with a poem and a powerpoint presentation of Thankyou Lord. The morning assembly was summed up with kinds words of encouragement and solidarity by our Provincial, Sr Anita followed by an address from our new Principal, Mrs K A Prabal.Thus, the serene service came to an end. On the 3rd of November, the students of class XII and XII simulated several sessions of the Constituent Assembly, since its inception on 9th December 1946, to highlight Dr B.R Ambedkar's contribution in framing the Constitution of independent India on his 125th birth anniversary. After Pandit Nehru's historic speech at the eve of independence, eminent politicians of the newly independent country debated on issues like Fundamental rights, the Directive Principles of State Policy, the issue of Hindi assuming the status of National language, the abolition of Zamindari System etc. Some of the issues remain unresolved to this day. This session not only served as an apt reminder of Dr. Ambedkar's immense humanitarian contributions in uplifting the conditions of the Dalit's, but also the urgent need to continue his dreams of an united secular India, at a time when religious intolerance is rife across the country. We are especially thankful to Miss Handa and Mrs. Bhattacharya for guiding us in putting up this show. 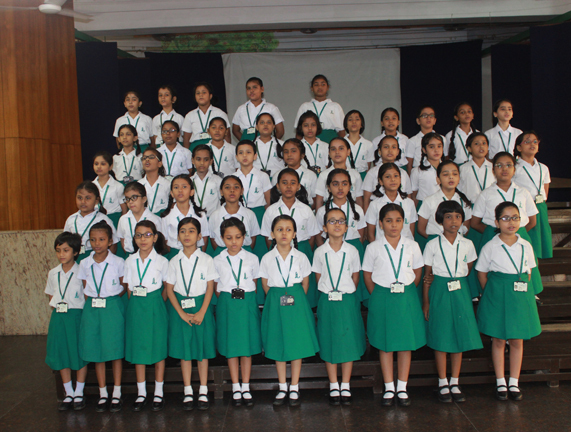 A special assembly was organized by the junior school on the 2nd Nov, 2015 to welcome our new Principal Mrs. K. Prabal. 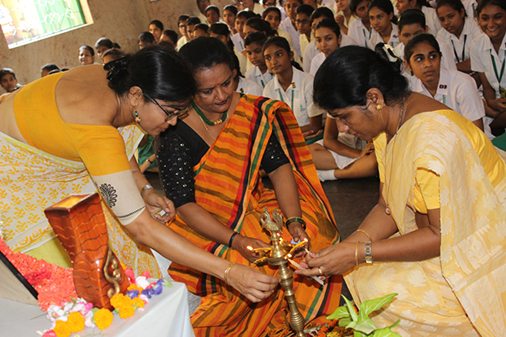 The programme began with the lightening of the Lamp by Sr. A. Braganza, Mrs. K. Prabal, Mrs. B. Chopra and Mrs. M. Partridge. It was followed by a prayer dance based on the theme of love. 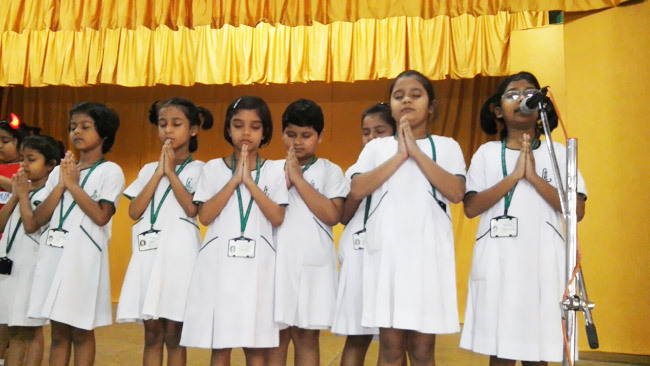 Next, the prayers were read out by the children to seek God’s blessings on our school, Principal, staff and students. A skit showing the true worth of a king was also put up. The assembly ended with information read out on some great leaders like A.P.J Abdul Kalam, Nelson Mandela, Barack Obama and so on. Along with the vote of thanks, our provincial Sr. A. Braganza also warmly welcomed our new principal Mrs. K. Prabal . Today on 31st October 2015, teachers of junior and senior school bid a farewell to Principal Sister Nirmala. A prayer service was organized by the coordinators of the school. It included prayer dance, video, power - point presentation, followed by an elocution. During the break time a farewell get together was arranged with Sister Nirmala. We bid farewell to Sister Nirmala with card and bouquet. 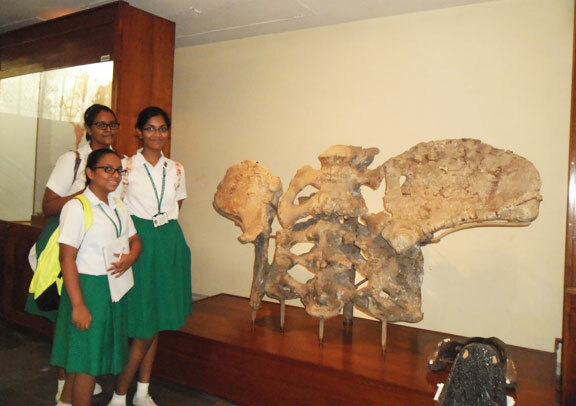 Classes 6, 7 and 10 (2) went on an educational tour on the 31st October 2015. We visited three places. The Jain Temple, Jorasanko Thakur Bari and Princep Ghat. Our first visit was to the Jain Temple where we saw exquisite designs and it was an impressive structure consisting of mirror – inland pillars. The interiors of the temple are splendidly beautiful. This shows the rich culture of the Jains. Our second visit was to Jorasanko Thakur Bari which is the ancestral home of the Tagore family and was a place where Tagore spent most of his childhood and died. We saw all the compartments of the house which was neatly kept and well maintained. It was an exhilarating experience, we learnt a lot. And our final spot to relax and have our food was Princep Ghat which is the oldest recreational spot of Kolkata. Here we all sat and ate our food and played and had a lot of fun. We returned to school at 2:30 pm. On 29th of October, 2015, the students of class 8 had gone to The Indian Statistical Institute (ISI) for their educational trip. We boarded the bus at 9:20 am and reached the destination within an hour. The campus was well maintained with a lot of trees. We headed to the auditorium where we saw an inspiring documentary film based on Prashanta Chandra Mahalanobis (AKA – PCM) the founder of ISI. After this we went to the geology museum where there was a brilliant display of an dinosaur’s fossils. The fossils, the bones and the preserved eggs enabled us to understand more about these gigantic creatures. Next we went to Mr. P.C .Mahalanobis’s resicence which gave us a detailed history about his life and a glimpse of this visionary’s simple lifestyle. Finally we visited the library – a treasure house of knowledge. The books we saw were mainly about statistics, economics, physics, computer science and even biology. On the whole this trip was an enriching experience something we will never forget. We would like to thanks Sister Nirmala, Mrs. De, Mrs. Banerjee, Mrs. Mukherjee and Mrs. Ghosh for giving us this wonderful opportunity to visit this place. Girls dealt with differential attitudes that they had regarding the topic. They spoke with confidence. Their views could be rebutted by the opponent team with questions. The girls had to speak for 2+1 minutes. The criteria for marking was the matter, pronounciation language and the way of delivering. 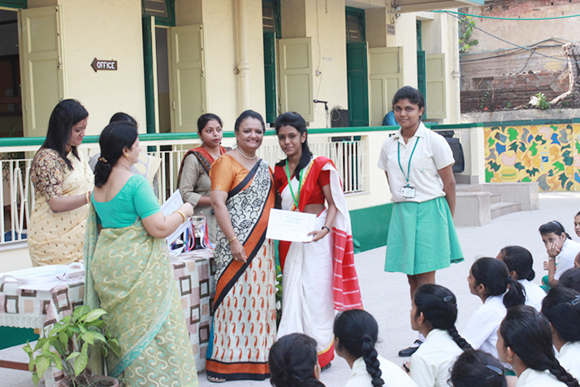 Shailja Sharma of class XII – H was awarded the best speaker. Red House or the Subhash Chandra Bose emerged victorious. This Experience was enrichening and filled us up with confidence. On 21st January,2015 some students from classes VI, VII, VIII and IX visited Birla Institute of Technology with Mrs. J.Banerjee. The students viewed the space science and aviation exhibition. After the exhibition students were taken to an open lawn where the flight of a miniature helicopter was demonstrated. From there, the students were taken for a 3D show on the Great Wall of China after which they saw various experiments with fire. Lastly we visited the Mathematics in the fire-y-tale which conveyed the message “Know fire for no fire”. On 20th July the institute of cost accountant of India had conducted a career counseling for class 11th and 12th had commerce section in our school. The session was conducted by Ms.Ankita Ray (Academic counselor ). Was a impressive session helping the students to select a path for their career. The CMA (Cost Management Accountant) course has basically three series of courses- foundation, intermediate and final. The session was very informative and thought provoking. 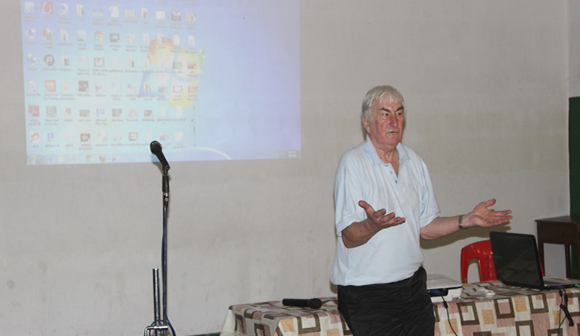 On the 6th of August, class XII – Humanities attend a value education class that was taken by Sir Fred Shwartz. The experience was enriching as he spoke about a topic that is quite essential in our lives, ‘Respect’. He told us about how to express our feelings in a calm and cool way, instead of yelling and crying. He told us not to get affected by what people say to us, as we know “what we are”. He said that respect is mutual and it comes along with love. When we love a person we are always respectful to him/her. “Respect is not demanded it comes from within” as I quote. The session was very interactive and he was a very good speaker and free with us. I hope we get such experiences in future, as these words of wisdom are generally very useful in our daily life as well as in the oncoming future. World Anglo Indian Day was celebrated on 1st of August, 2015. The day began with a solemn thanks giving prayer service at St.Thomas Church, Middleton Row and had been attended by the office bearers of the Association of Heads of Anglo-Indian Schools (AHAIS) and Principals of various Anglo-Indian Schools. An inspirational message was delivered by Archbishop Thomas D’souza. A few games were organized for the NGO children of different institutions. It was wonderful to see the priceless smiles on their faces when each of them received a gift. The latter part of the programme consisted of a fellowship meal. Our sincere thanks to Sr.Phyllis and AHAIS for organizing such a dreadful event. 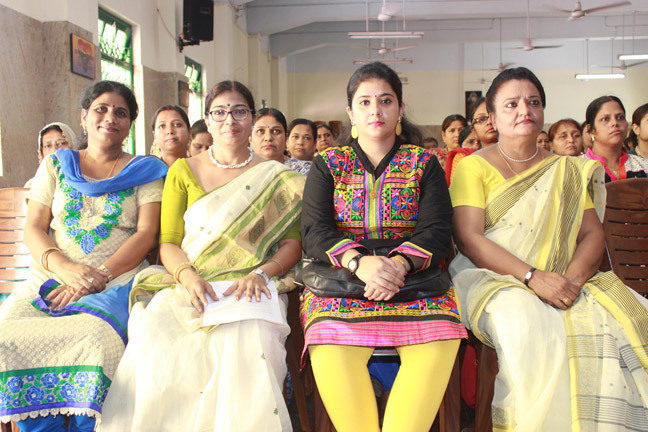 On the 16th of July, 2015 a Bengali Elocution competition was held. 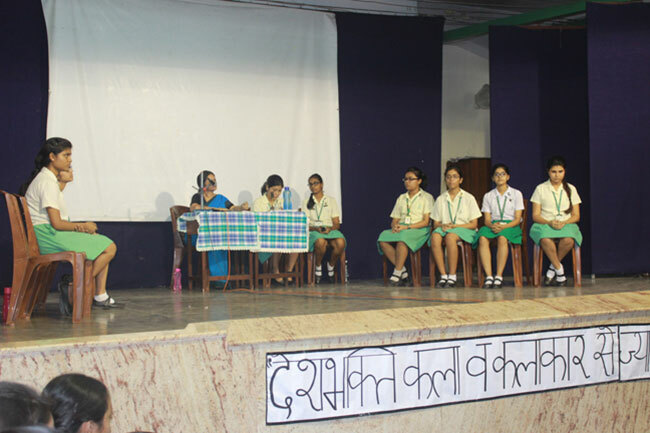 Bengali girls from class IX to XII participated in the competition. The competition was divided into two groups. 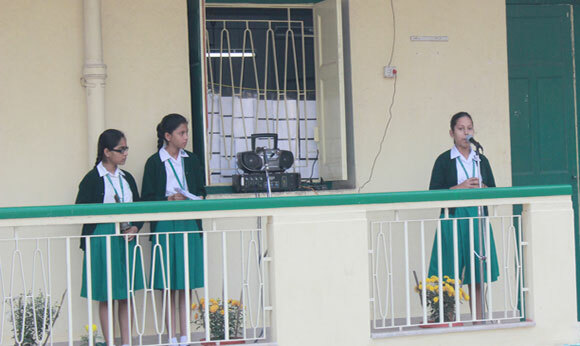 The 1st part was group elocution which was elocuted by the girls of class IX to XII. The 2nd part consist of girls from each house who elocuted a poem. It was an inter-house elocution competition. 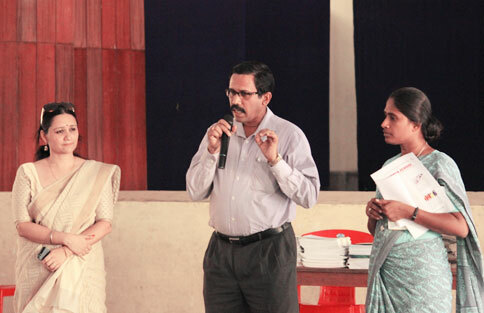 Two esteemed teachers from Loreto Sealdah and A.G.School were invited to judge the elocution competition. Class IX was rewarded the 1st position which was followed by Class XII who were the 2nd runner up and then the Class X who came 3rd in the group elocution. The solo elocution competition was won by Amreeta Das from Mother Teresa House and Chaity Puja Sarkar of Sarojini Naidu House came 2nd and the 3rd runner up was Sinthia Saha from C.V.Raman House. On 10th August,2015 the Junior school and middle school were given a training session by Inspector ProsenjitChakroborty on how to keep ourselves safe and secure on the roads as pedestrians and drivers. We were shown a presentation which showed us how the traffic Police officers work day and night for the Management of roads. We have learnt about the rules that pedestrians as well as drivers need to follow for their safety, the different manual and automatic signals and the different signposts that are present on the road for our facility. We were also cautioned by showing us a few video clippings on road accidents that are basically an outcome of our not being alert. Overall, it was a very informative and enlightening session that helped us to realize how to keep ourselves as well as people around us safe on the roads. On the 9th of July, 2015, class XII-Humanities attended an orientation organized by our Principal – Sr.A.Nirmala. It was conducted by “World Vision” NGO. The orientation began at 8:15 am and continue till 1 pm. The session aimed at helping us identifying our skills and our nature. It also helped in becoming aware of our fears that is hidden within us. We were made to act our different situations of fears and various inner voices that go with it. They also helped us in prioritizing our time with the help of the “SW-IH” techniques, which would also help in setting a clear idea in view of our goals and career. The session was truly an inspiring one where we learned to overcome our fears, time management & making a clear picture of our future. It wsa an enriching and enjoyable experience. We would like to thanks Sister for giving us such a lifetime experience. On 7th of July, 2015, the senior school involving classes IX, X, XI & XII had registered their bank accounts in the Canara Bank, Park Street. One of the bank officials had visited the school premises personally to help out the girls in their registration. This session was conducted under the guidance of Ms.D.Majumdar. Representatives being Mehndi Raza & Sakina Sharique. 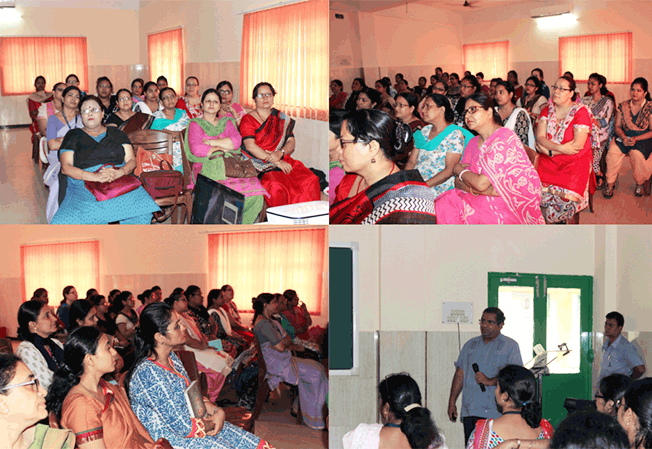 A Staff Orientation was held on 24th of June, 2015 in the AV Room of the Junior School. It was conducted by Father Paul Pudussery CSC. The topic was very apt and reflected the need of the hour. “Reimagining education in the 21st Century”. The changed role of the teachers; as facilitators of the learning process were highlighted. Teachers are capable of creating a positive environment and they need to teach survival skills to the children. The session was meticulously planned and intelligently organized. It had various interesting charts, detailed diagrams, animated anecdotes and moving visuals to emphasize the shift in pedagogy in the modern world. They also reiterated the necessity of a teacher possessing knowledge at all levels- subject, pedagogical and technological for the miracle to unfold in a child’s life. The workshop was in fact a live demonstration of a foolproof way to both, time and classroom management. It was a real eye opener and learning experience for one and all because one “Who dares to teach must never cease to learn”. On 6-8-2015 there was a career counseling session held in our school campus from 11:30 A.M – 1:30 P.M. The session was conducted by the Hindu newspaper and IMS.Mr satyapaul, a lawyer by profession discussed with us the advantages and criterias for pursuing Law. Mr.Kaustab focused on a variety of other career options like Hotel Management, Bachelors in business Administration and Mass Communication. The session was very informative and helped us to decide the path for our future studies. 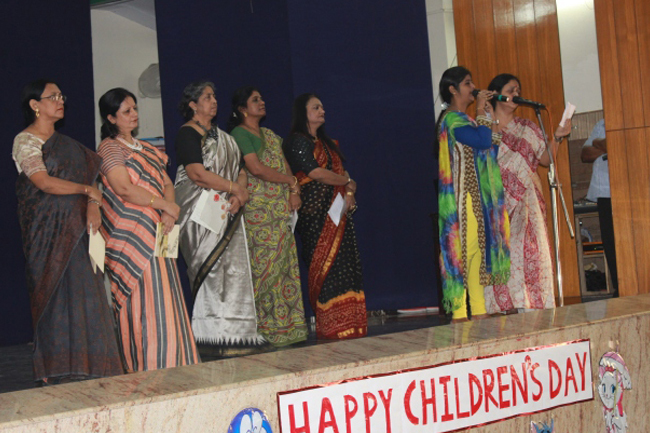 On 13th of July, 2015, class XII celebrated Parents Day in the Junior hall. It began at 11:45 am and ended by2 pm. The programme began with a prayer dance followed by a short prayer service. After this Mrs.Govindraj introduces the theme of the interactive session between the parents & the teachers. An interactive session reaped great dividends as the parents could retake to the role plays enacted and therefore give their valuable inputs on how to track the different situations that were dramatized. A power point presentation on social networking that was informative & interesting that was shown t the parents. The session ended with a vote of thanks by the Principal – Sister A Nirmala. The La Martiniere for Boys Patriotic Meet organized by the “Hindi Jyotsna Club” took place on the 16th of August, 2015. Loreto Elliot Road took part in singing and dancing. All the students had to report there at 4 O’Clock. The event was very well organ9ized. 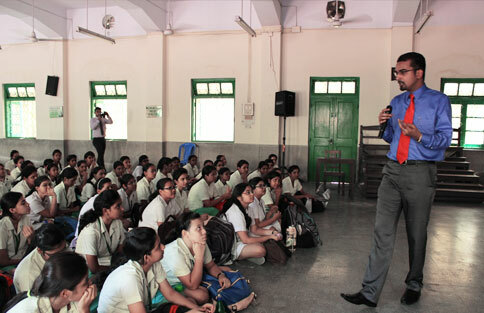 There were many other schools present namely Sri Sir Academy, La Martiniere for Girls and ofcourse the host school too. It was a wonderful experience for us. We felt honored and proud to belong to a country so full of rich culture and heritage. We experienced the true colours of our sountry and the celebration of Independence made our experience more vivid and lovely. On the 10th of December ’14 Class IX’s had gone for their school picnic to Ibiza. We left school in a chartered bus at 7:45 am and reached there by 9:30 am. After entering the resort we were taken to the garden where we settled down to eat. After a while we were taken to the disco which was within the premises of Ibiza. It was the first experience of a disco for most of the girls. 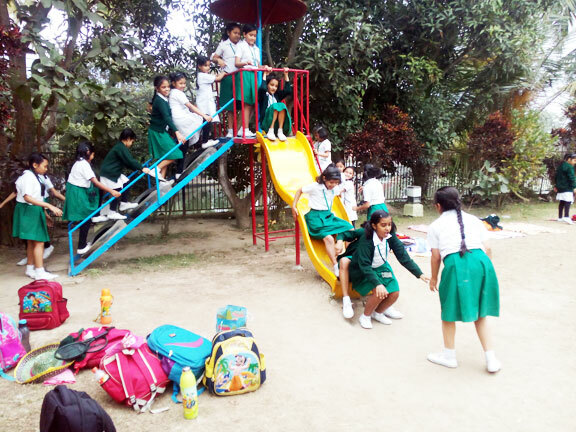 We came back to the lawns relaxed, clicked photographs, went for nature walk and spent some quality time with our friends and teachers. At about 2 pm we left the resort to return back to school. The picnic was an immensely enjoyable one for us. We would like to thank our principal Sr. Nirmala and our respective class teachers for this wonderful day. On the 5th of August 2015, We, the students of Loreto Day School, Elliot Road bid farewell to one of our sweet and loving teachers - Mrs.Louis . Mrs . Louis has been working for this school for 25 long years. Her journey began in the year 1990. She is the epitome of ebullience and love or let us say, in a nutshell, she is an embodiment of motherhood .Both teachers and students have agreed that Mrs. Louis was one such person who was very punctual .Not only that but also she'd act as a catalyst to our work. She is in its true essence the straw that stirs the drink. We bid our beloved Mrs. Louis a farewell and she moves into a new venture, may the luck and success be with her. 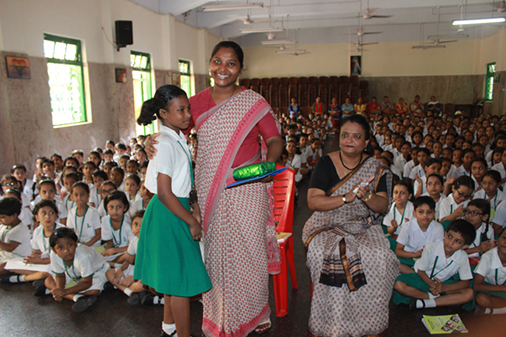 We put up a programme for her which began with a special assembly on Dr. A.P.J. Abdul Kalam followed by a prayer service and prayer dance .We then gave miss a ride down the memory lane by showing her a powerpoint presentation of the 25 glorious years of her stay with the Loreto Elliot Road. After which one of her colleagues and Sister spoke about her. Finally, Mrs.Louis read out a poem which she wrote all by herself for us and said a few words. We bade farewell to miss with lots of love in the cards and bouquet that we made for her.And forever will the classrooms and staffroom of Loreto Elliot Road testify and miss the gregarious and lovely Mrs.Louis . The last picnic for the outgoing batch of class X's was organised on the 18th of December, 2014. The venue chosen was the newly opened Eco Park in Rajarhat. We left from school at 10 AM with both our class teachers and two parents accompanying us. We reached there in half an hour. It is a huge place and the first segment we visited was the Mask Garden after which we proceeded to the Children's Park. There were so many swings and slides over there with a small stream of water flowing in the centre. Everyone was happily reviving the good old days of class Nursery. We ate over there and then a few of us did the bull ride and some of us went to the air-pumped castle. We then went by the lake and spent the last hour there. It was a very soothing & overwhelming time for all of us as we realized that this was maybe the last school picnic for so many of us. After some time we boarded the bus and left for school. The bus journey was a mixed bag of tears, laughter and smile. We reached school at 4:30 and everyone was busy saying goodbye and hugging each other. It was such a beautiful experience for us and we would like to thank our teachers who went with us and the two parents. It was truly a day well spent! 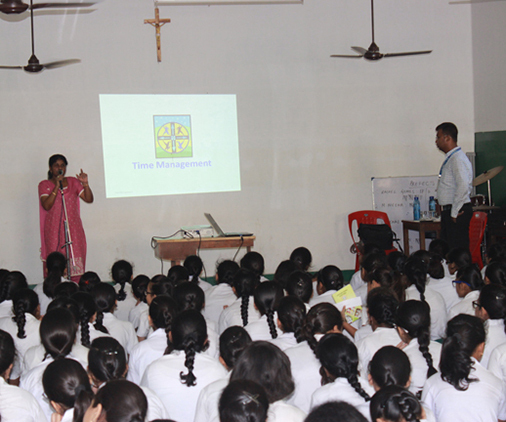 On the 4th of August, 2015 a session was conducted by Sister Monica for the middle and senior school. The session brought the students across the harsh realities faced by the underprivileged every day in the very state of Bengal. It was a very informative session, and created an awareness about the Kolkata Mary Ward Social Cell which is a NGO organized and run by the Loreto sisters, it's marvelous efforts for the uplifting of the underprivileged classes and the unapologetic risks taken by them to serve humanity. The NGO is currently working on 12 projects dealing with the education of the untouchables in Sonagachi, saving women and children from the horrors of trafficking, providing a home for these classes etc. We as students of such an esteemed family would sincerely like to extend our hand and contribute to the ocean of sincere effort to help the NGO. 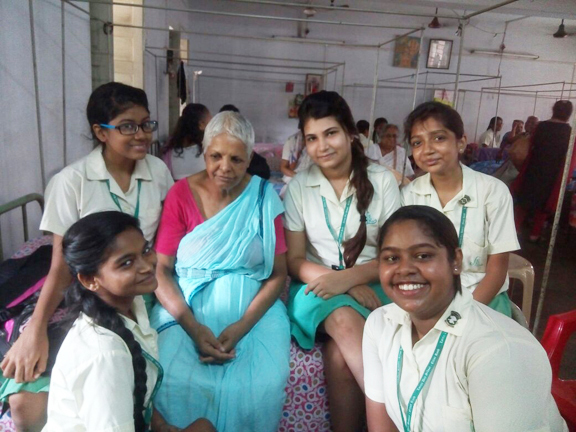 Loreto Day School Elliot Road conducted a two day educational excursion to shantiniketan for the student of classes IV, V & VI. The Trip was held on the 28th and 29th of August, 43 students accompanied by three teachers (Mrs. T. D’souza, Mrs. M.Partridge and Mrs. R.D.Osta). The trip was a great exposure to students and teachers as it was a great learning experience about “Bengal’s Heritage”. 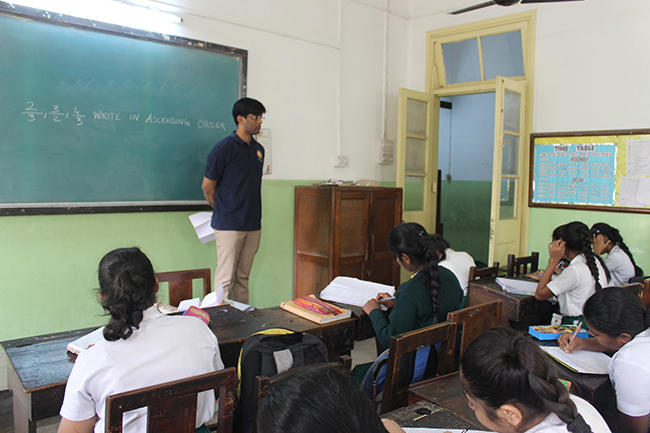 On the 12th of August 2014, an orientation was organized in collaboration with world vision Prayasam for the class nines. Prayasam is an organization dealing with the child rights and the theme for the orientation was to spread awareness about social networking among the teachers.There were a number of case studies of global Teen leaders and their contribution to the society. Student shared their experiences with social networking sites and gave examples of how they usedsuch networks for a beneficial purpose. Prayasam nominates twelve Indian teenagers every year to honour with the title of “GLOBAL TEEN LEADER”. There was an activity in which we had to make an audit on the ups and downs we face in life due to the influence of our social networking circles. The overall experience was quite inspiring for us as the organizers kept on motivating us to work for our society through social networking for a brighter tomorrow. 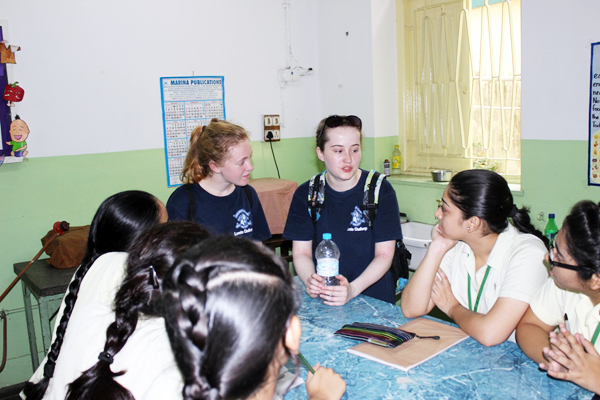 On the 7th of July 2014, ten students from Loreto College Manchester, UK visited us for a few days. They were welcomed with the Loreto Chorus being sung by the middle school girls. On 8th of July they attended part of the Parent’s Day Program of the middle school. They interacted with the XII-commerce girls on 9th of July. Our girls from class XII rendered the Earth song for them as well. This was followed by an interaction with the junior school students. The various interaction were an eye opener for us I am sure that the unknown barriers have dissipated as we realize that we are a part of ONE LORETO FAMILY. They say”success comes to those who chase it”. What they do not specify however, is that, the chase for success is a long and tedious one. However, despite all that, when success finally comes in through the door, it is a feeling of great elation that one feels. Recently, Loreto Day school Elliot Road too had a taste of this elation after we put up a hugely successful annual concert which received appreciation from one and all. Based on playwright George Bernard show’s “Arms and the Man”, this play, which was renamed as “The Chocolate Cream Soldier” was a musical adaptation of the same. The primary focus of this play was to bring to the forefront, how, despite all the wars that mankind fights, in the end, everyone is “drunk on the idea, that love, and love alone could heal us”. 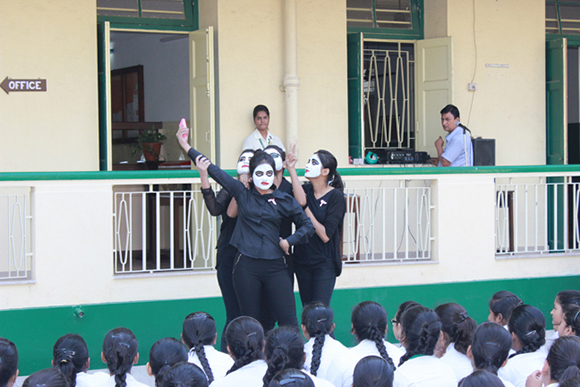 The concert began with a mime show, depicting war at different stages. This was followed by a short prayer and then, by the play. The deafening applause from the audience as well as their appreciative chuckles after each cheesy line was itself proof of how thoroughly everyone enjoyed our play. Yes, we worked hard and chased success blindly for weeks together, and finally, when we attained it, it refreshed us with its sheer spirit of joy, leaving us hungry for many more such successes in future. 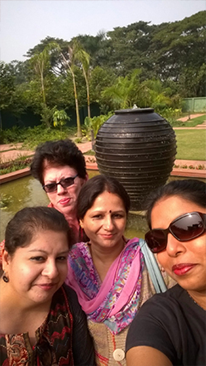 On the 17th of January the middle section of our school was taken for a picnic to Eco park, Rajarhat. We left around 11:00 am and reached the Eco park at 12:00 pm. A part of the park was exclusively booked for us. We had a great time enjoying ourselves in the park. We took a lot of pictures, and had our lunch there too. The entire atmosphere was full of fun and frolic. We boarded the bus back to school at 3:15 pm. It was a day well spent and enjoyed by everyone. Each of us took back a lot of memories as we spent our day in the lap of nature. 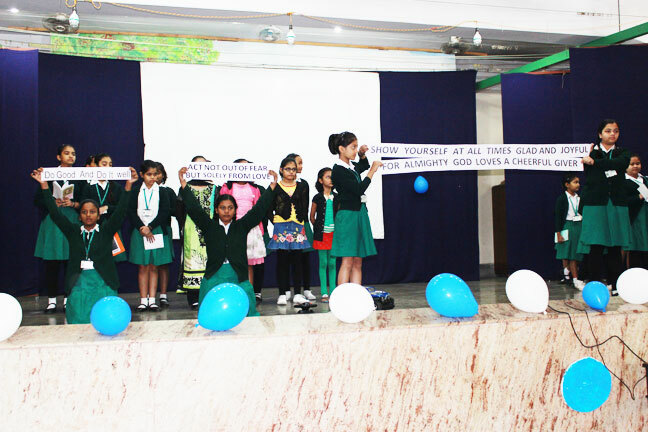 The Junior School English Elocution Activity was held on the 20th of August, 2014 in the junior school hall. Classes I to V presented delightful poems. Senior school English teachers Ms S. Handa and Mrs P Quandra were invited to judge the programme. The children were divided into two groups. 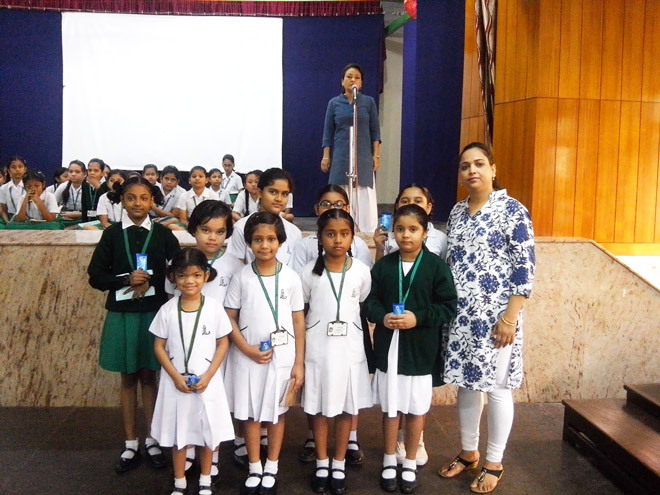 Group A consisted of classes I & II and Group B consisted of classes III ,IV, & V. The winners were class II section(i) from Group A and class V section(i) from Group B.
Mrs. Quadra congratulated the children on their brilliant performance. 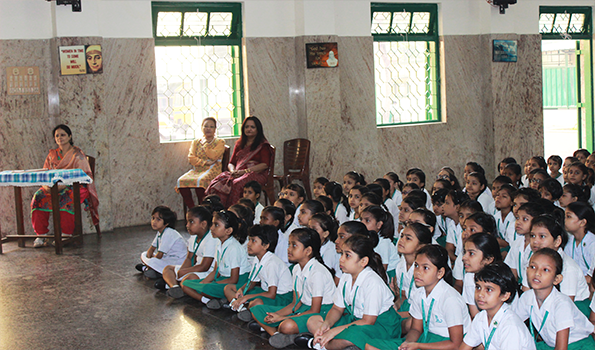 The Principal, Sr. Nirmala encouraged the children by praising their efforts. The programme ended on a happy note.